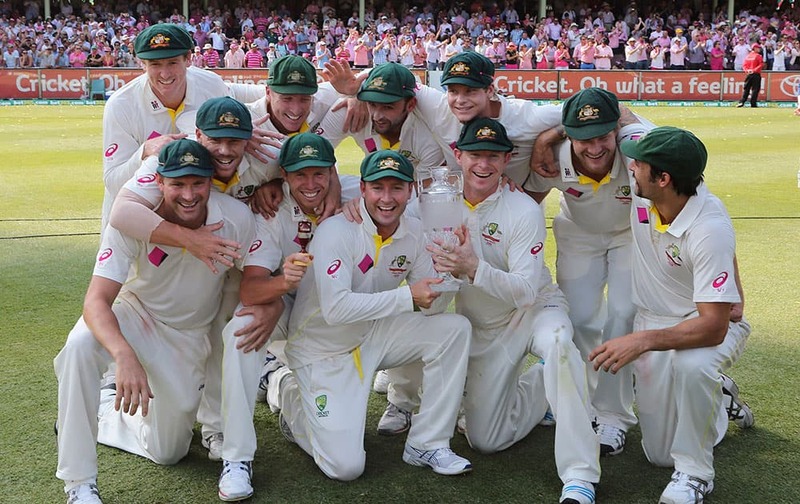 Australian players pose with their trophy after winning their Ashes cricket series against England in Sydney. 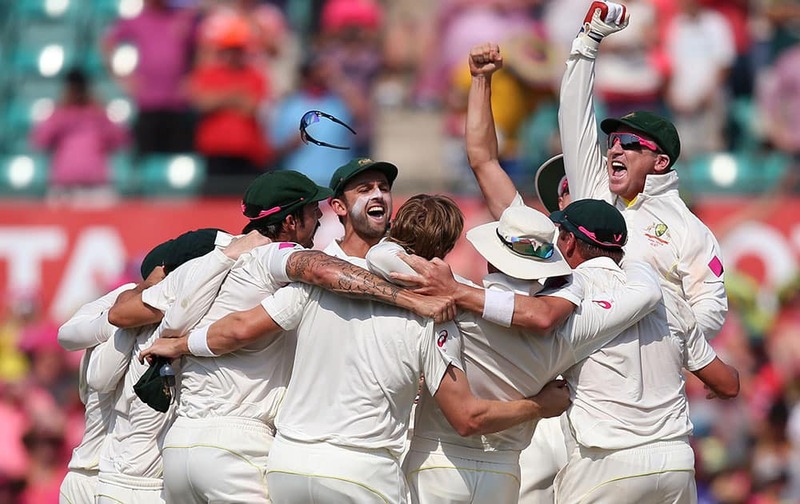 Australia won the series 5-0. 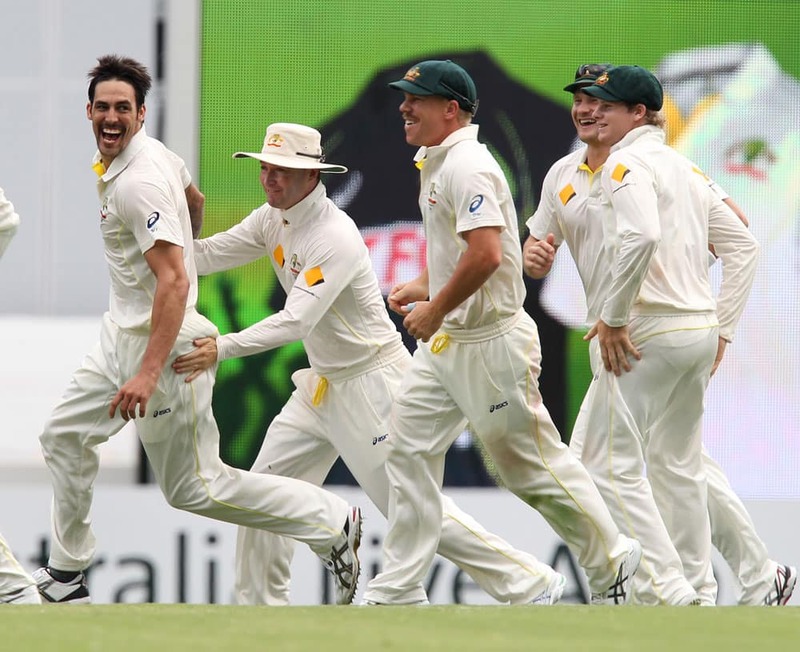 Australian players celebrates after winning the Ashes Cricket series against England in Sydney. 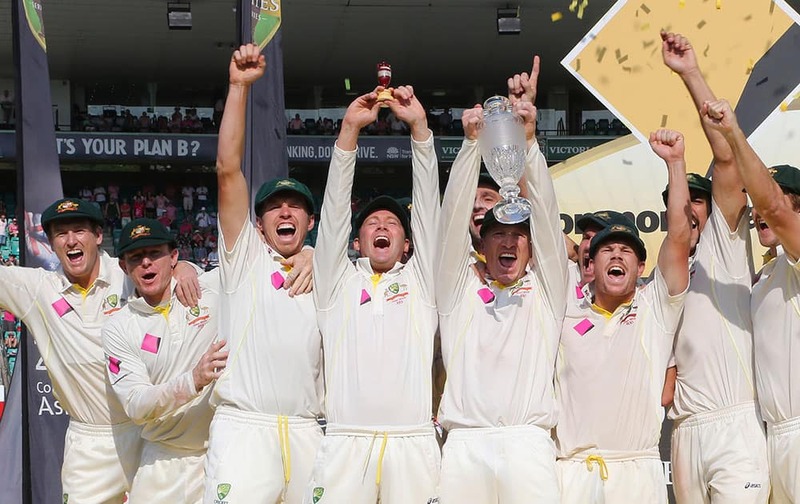 Australia won the series 5-0. 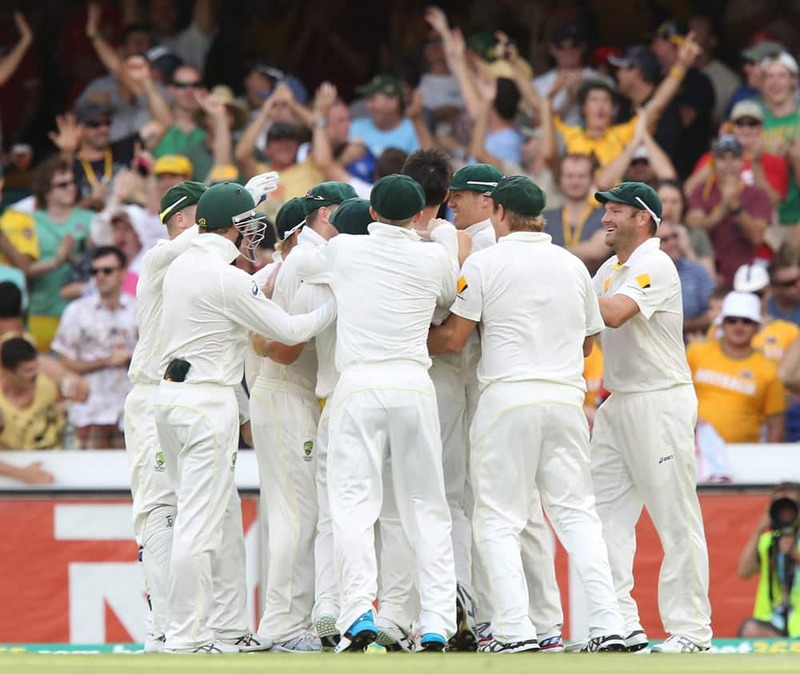 Australian teammates huddle at mid-wicket to celebrate their victory over England on day 3 of their Ashes cricket test match at the Sydney Cricket Ground in Sydney. 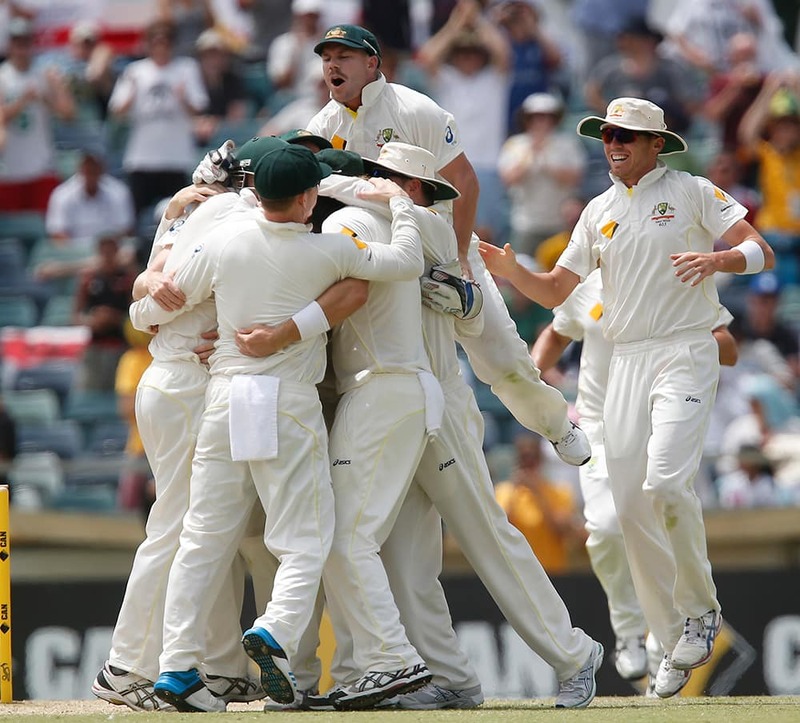 The Australian cricket team gathers in the wicket to begin their celebrations after their victory over England on day 3 of their Ashes cricket test match at the Sydney Cricket Ground in Sydney. 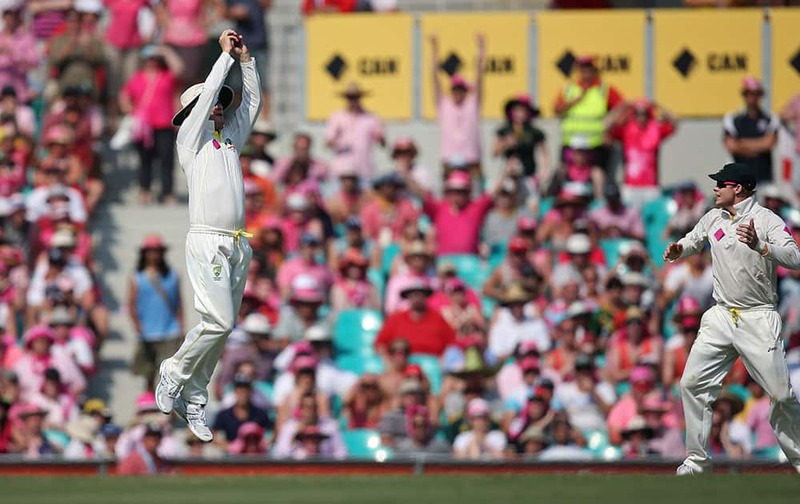 Australian captain Michael Clarke makes the last catch for victory over England on day 3 of their Ashes cricket test match at the Sydney Cricket Ground in Sydney. 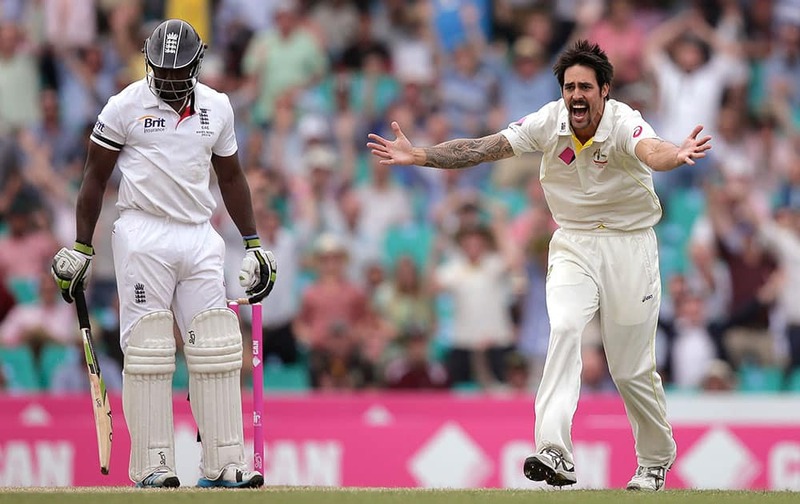 Australia's Mitchell Johnson, right, celebrates taking the wicket of England's Michael Carberry, left, for 43 runs on day 3 of their Ashes cricket test match at the Sydney Cricket Ground in Sydney. 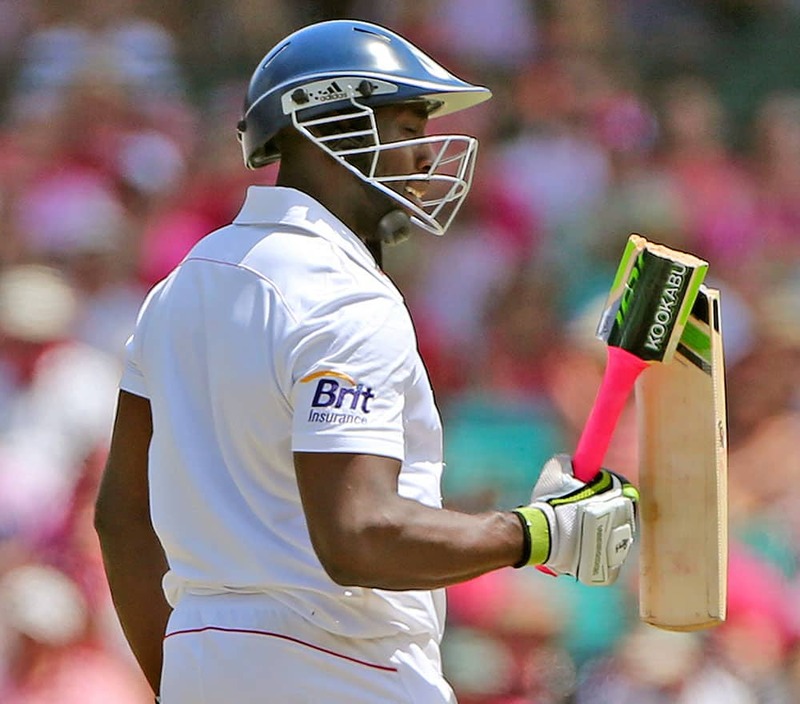 England's Michael Carberry looks at his broken bat on the third day of their Ashes cricket test match against Australia in Sydney. 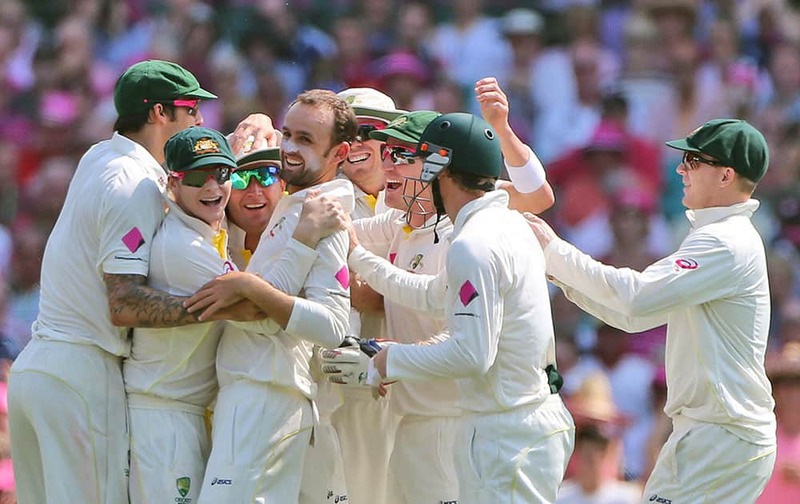 Australia's Nathan Lyon center, and teammates celebrate after taking the wicket of England's Scott Borthwick on the third day of their Ashes cricket test match in Sydney. England's Jonny Bairstow appeals for a wicket on the second day of their Ashes cricket test match against Australia in Sydney. 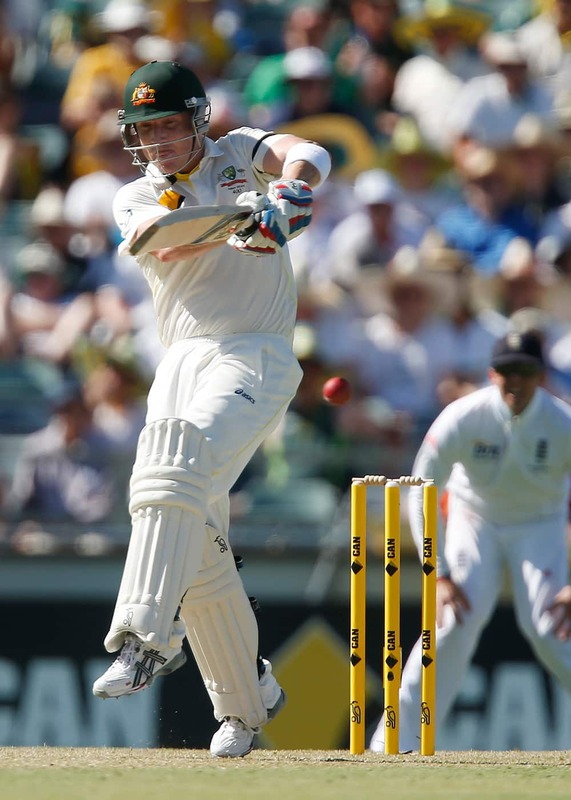 Australia's Chris Rogers drives the ball against England during their Ashes cricket test match at the Sydney Cricket Ground in Sydney. 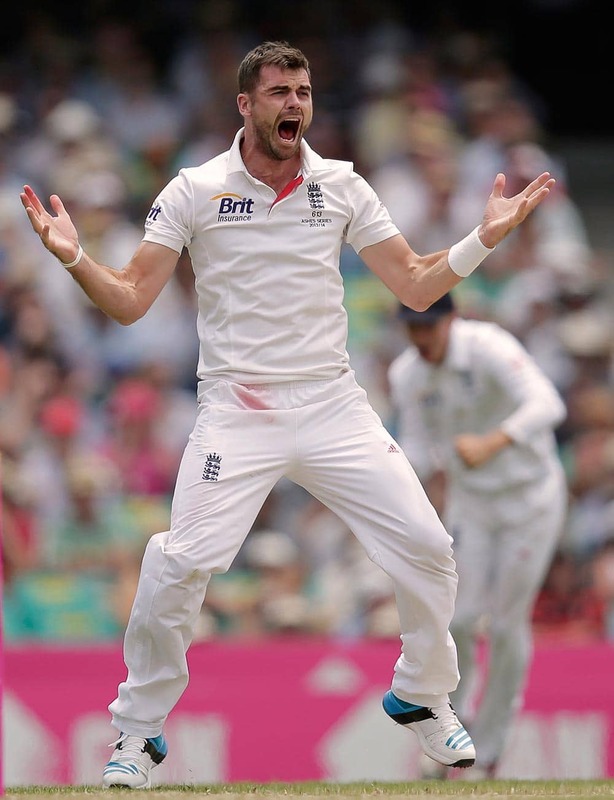 England's James Anderson celebrates after taking the wicket of Australia's David Warner during their Ashes cricket test match in Sydney, Australia. 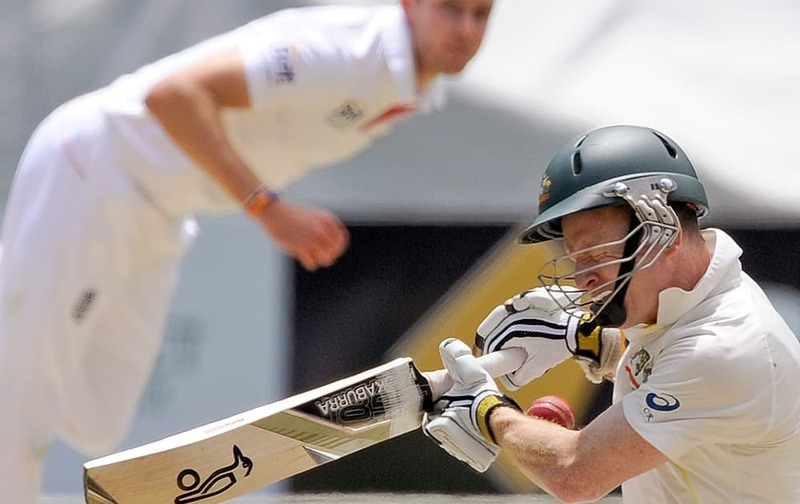 England's Ben Stokes, left, prepares to sweep Australia's Nathan Lyon for 4 runs as Brad Haddin sets up behind the stumps during their Ashes cricket test match at the Sydney Cricket Ground in Sydney. 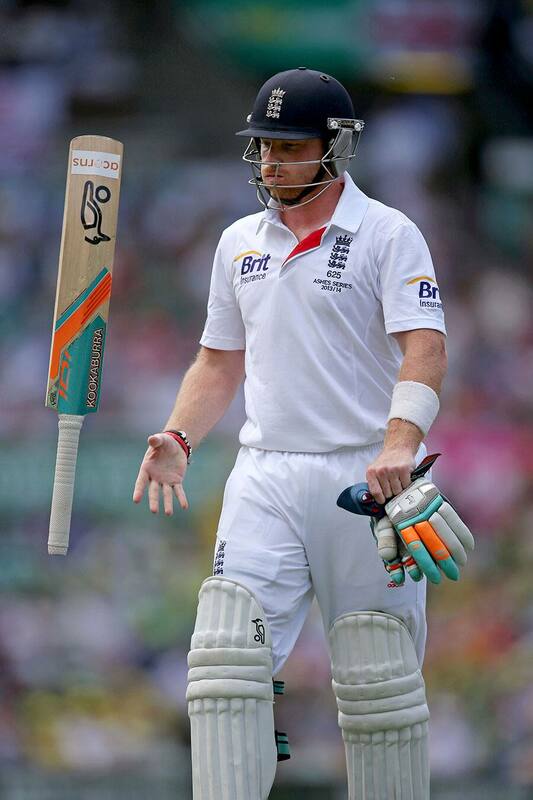 England's Ian Bell tosses his bat after he was caught out for 2 runs against Australia during their Ashes cricket test match at the Sydney Cricket Ground in Sydney. 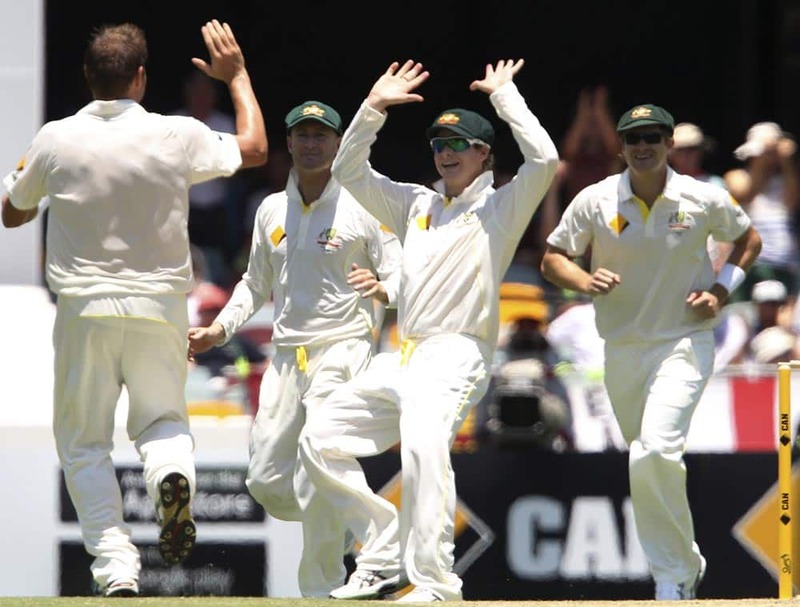 Australia's Shane Watson, left, David Warner, center, and Ryan Harris, right, celebrate after taking the wicket of England's Kevin Pietersen for 3 runs during their Ashes cricket test match at the Sydney Cricket Ground in Sydney. 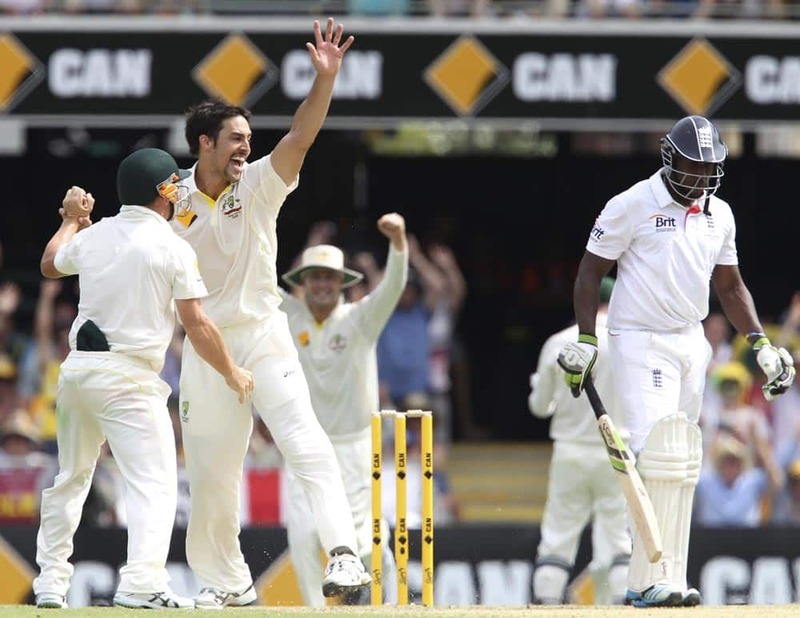 England's Michael Carberry, left, stands his ground as Australia's Mitchell Johnson appeals for a LBW decision on Carberry in their Ashes cricket test match at the Sydney Cricket Ground in Sydney. 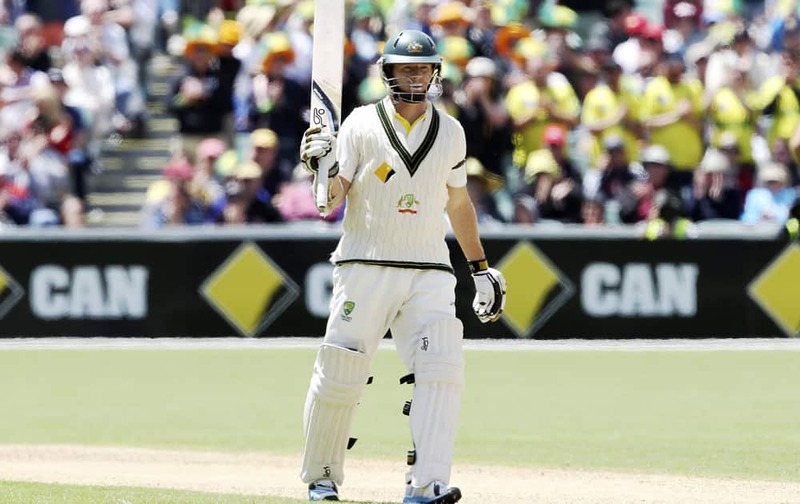 Australia's Steven Smith celebrates after hitting a century in their Ashes cricket test match against England in Sydney, Australia. 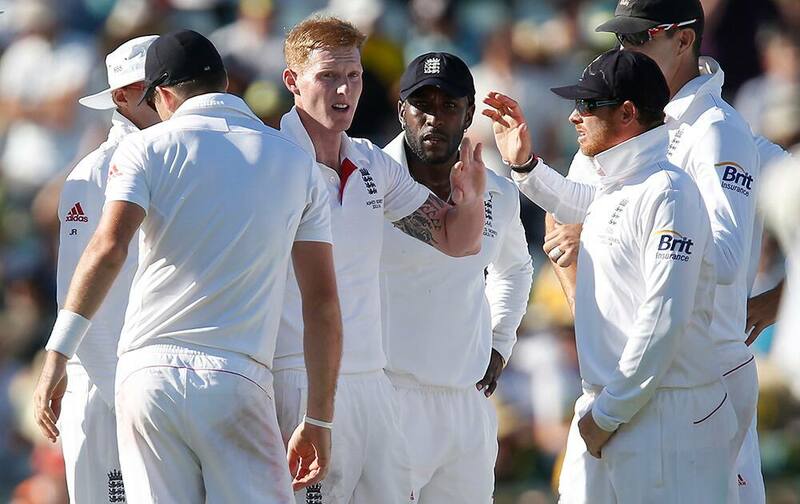 England's Ben Stokes, third right, holds up the ball after taking 5 wickets against Australia in their Ashes cricket test match at the Sydney Cricket Ground in Sydney. 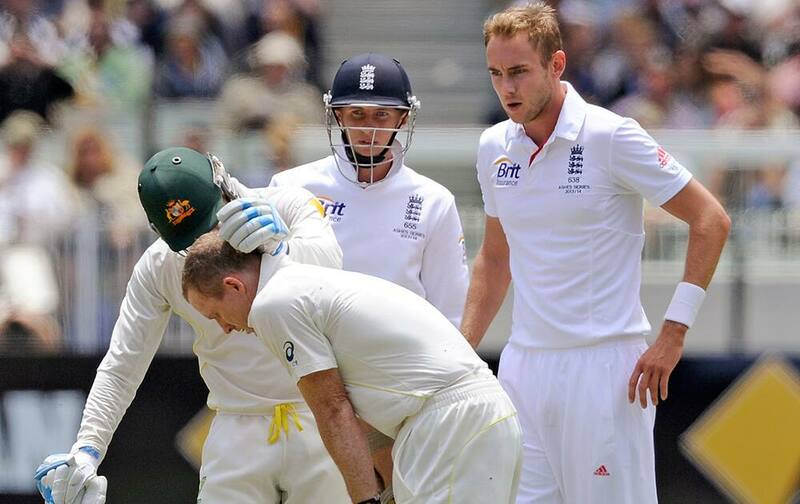 Australia's Ryan Harris and England's Stuart Broad chat during their Ashes cricket test match in Sydney. 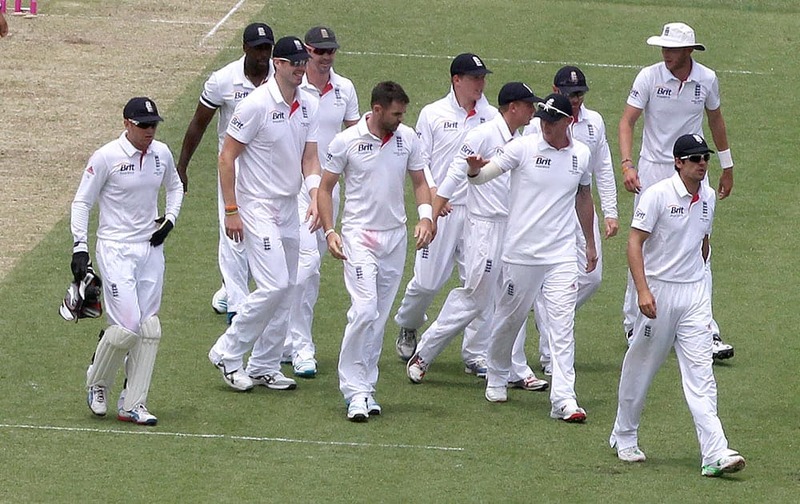 England cricket captain Alastair Cook, front right, leads his team off the field during their Ashes cricket test match against Australia in Sydney. 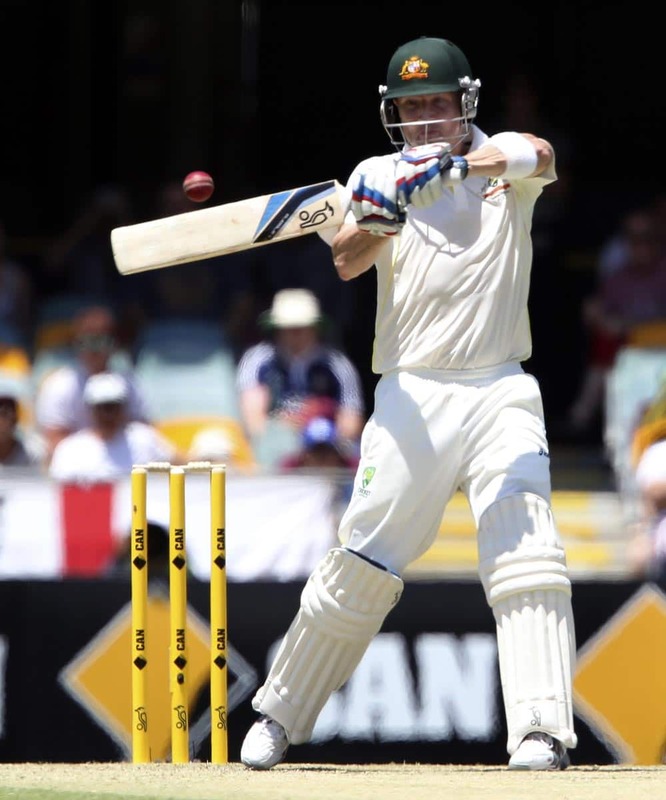 Australia's Brad Haddin drives the ball against England during their Ashes cricket test match at the Sydney Cricket Ground in Sydney. 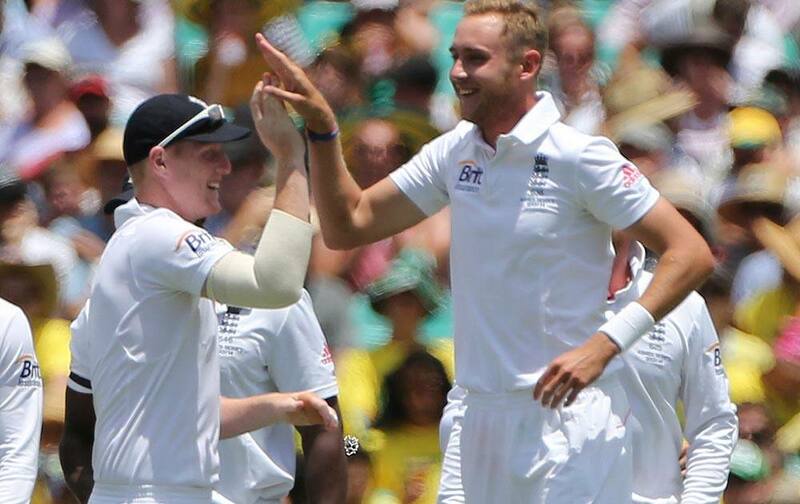 England cricket players Ben Stokes, left, and Stuart Broad celebrate for taking the wicket of Australia's George Bailey during their Ashes cricket test match against Australia in Sydney. 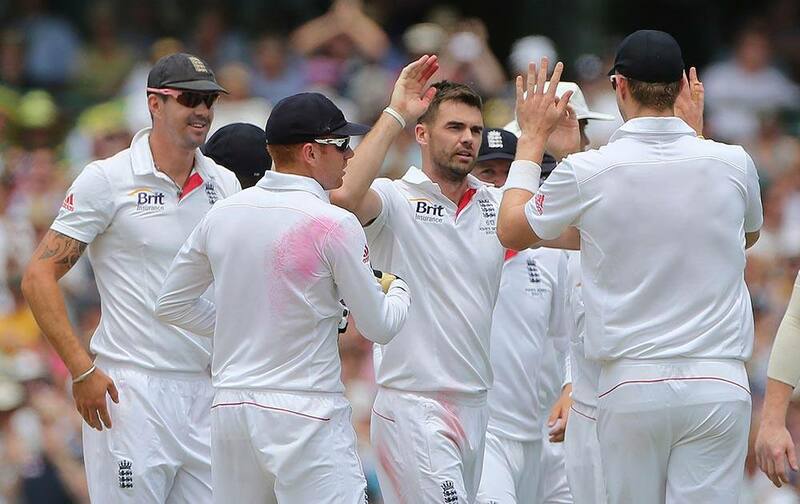 England cricket player James Anderson, center, celebrates with team mates after taking the wicket of Australia's Shane Watson on the first day of play during their Ashes cricket test match in Sydney. 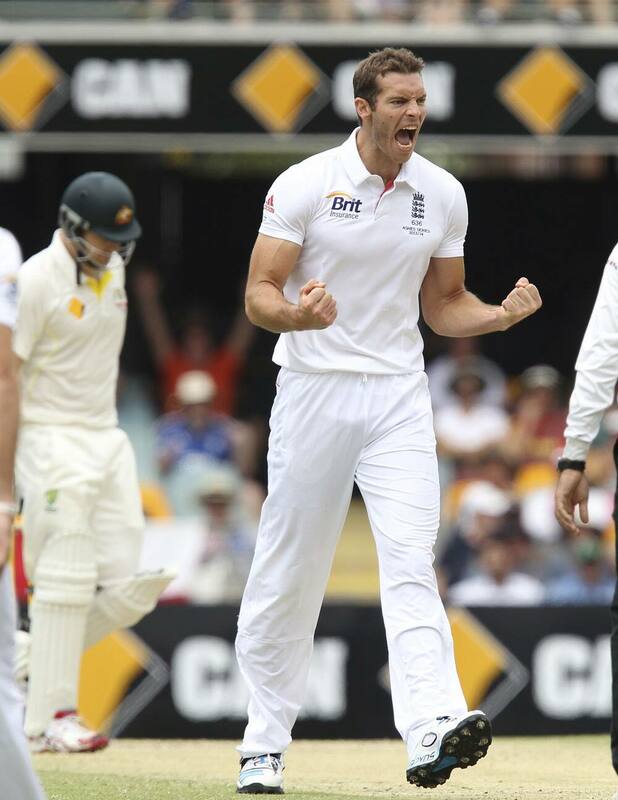 England's James Anderson celebrates being given a LBW decision on Australia's Shane Watson for 43 runs in their Ashes cricket test match at the Sydney Cricket Ground in Sydney. 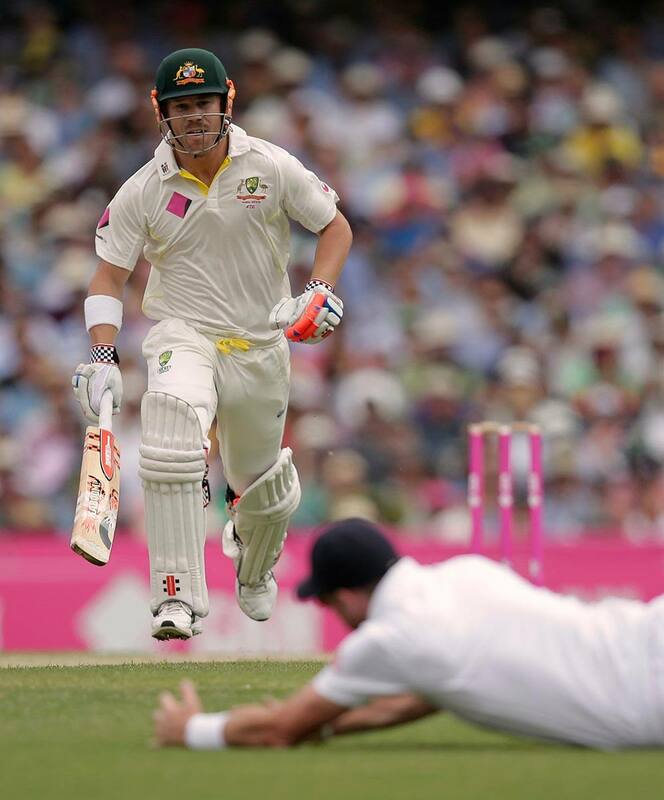 Australia's David Warner, left, makes runs as England's James Anderson dives to attempt a fielding play in their Ashes cricket test match at the Sydney Cricket Ground in Sydney. 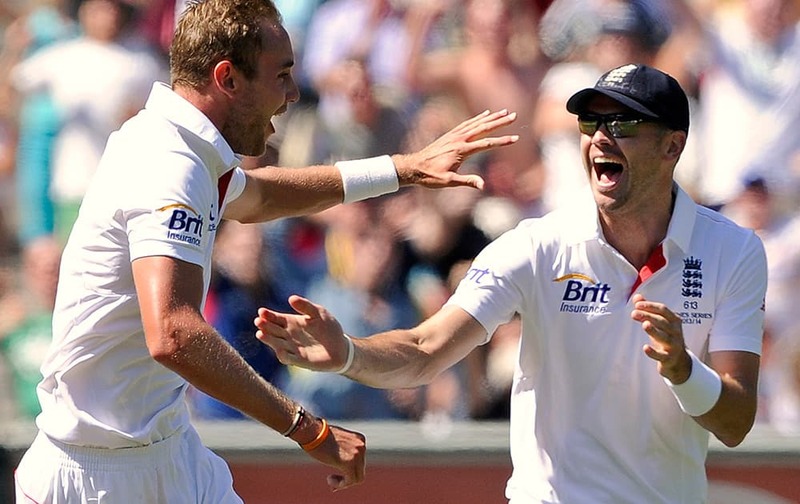 England cricket captain Alastair Cook, left, celebrates with his teammate Stuart Broad, right, after bowling out Australia's David Warner during their Ashes cricket test match at the Sydney Cricket Ground in Sydney. 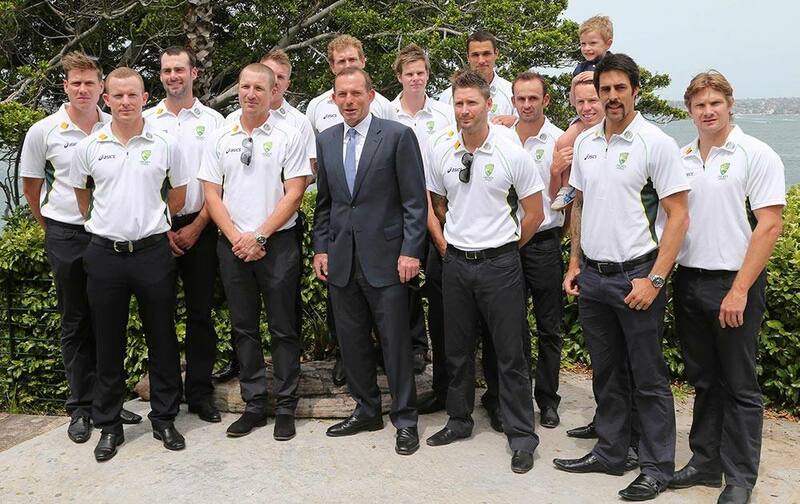 Australian cricket team members poses for a photo with Australia's Prime Minister Tony Abbott, during a New Year's Day reception at Kirribilli House in Sydney, Australia. 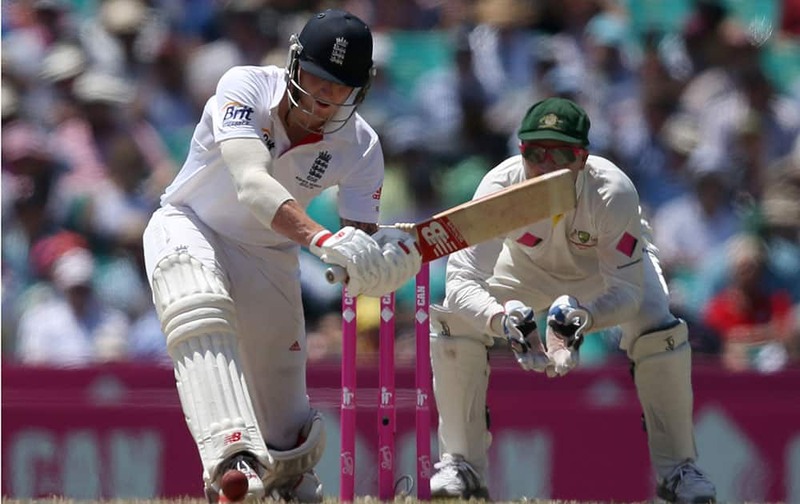 Australia and England play in the Sydney Ashes test match on Friday, Jan. 3, 2014. 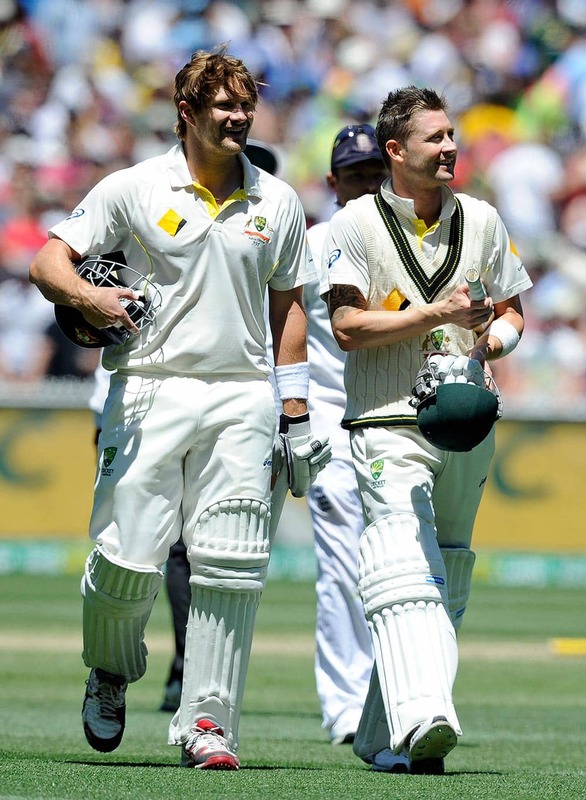 Australia's Shane Watson, left, and Michael Clarke walk off the field after defeating England in their Ashes cricket test match. 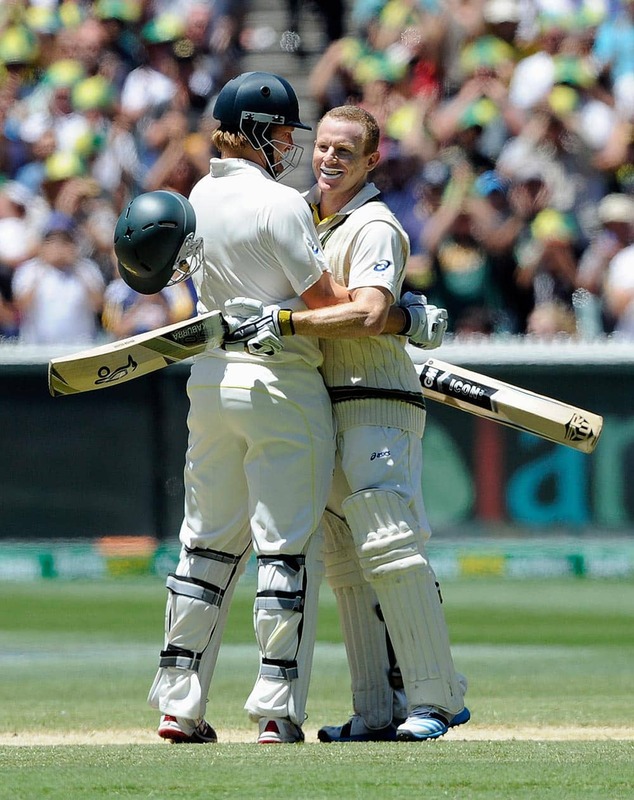 Australia's Shane Watson, left, congratulates Chris Rogers on making 100 runs against England during their Ashes cricket test match. 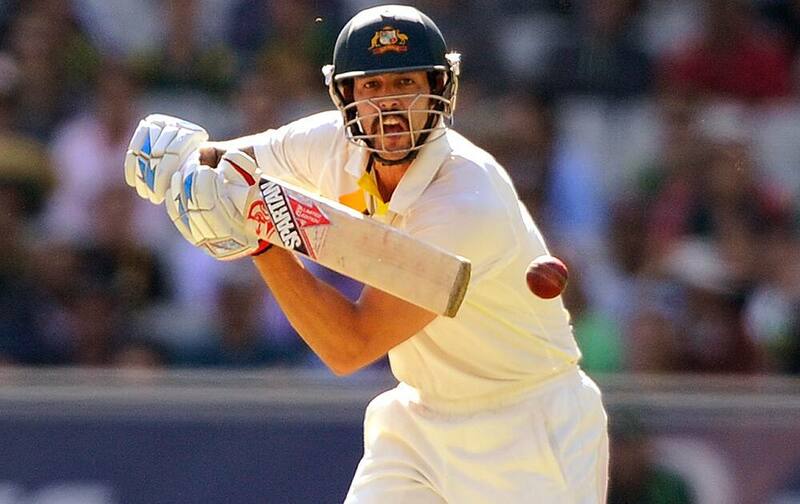 Australia's Shane Watson drives against England during their Ashes cricket test match. 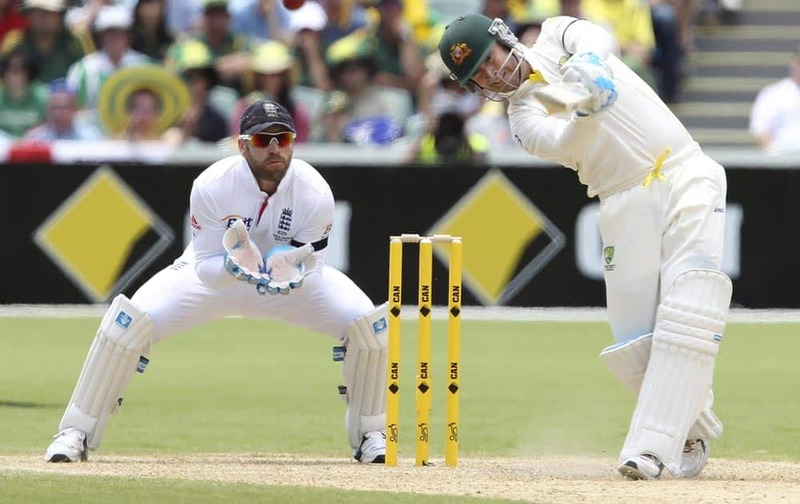 England's Jonny Bairstow, left, and James Anderson, right, watch as Australia's David Warner pulls the ball during their Ashes cricket test match. 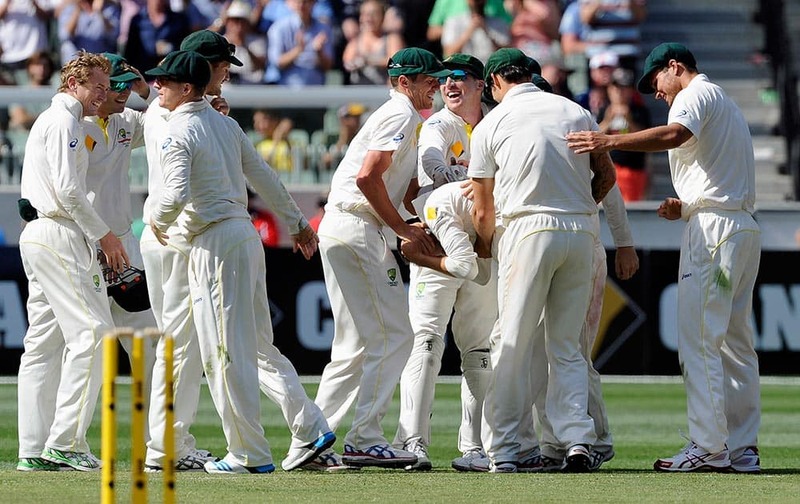 Australian players celebrate the wicket of England's Stuart Broad off the bowling of Nathan Lyon during their Ashes cricket test match. 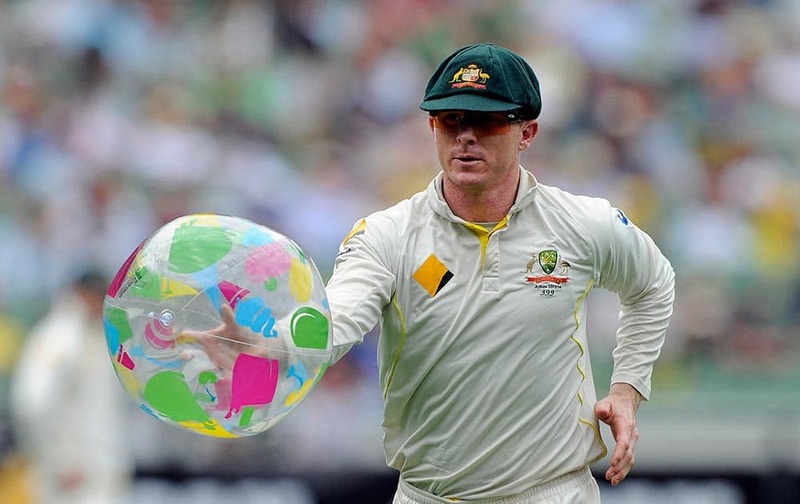 Australia's Chris Rogers removes a beach ball from the field during their Ashes cricket test match against England. 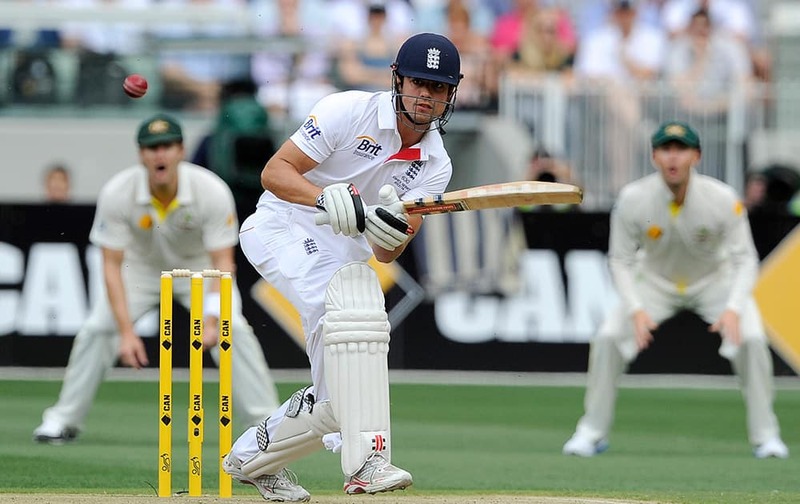 England's Alastair Cook runs between stumps while playing Australia during their Ashes cricket test match, at the Melbourne Cricket Ground in Melbourne, Australia. 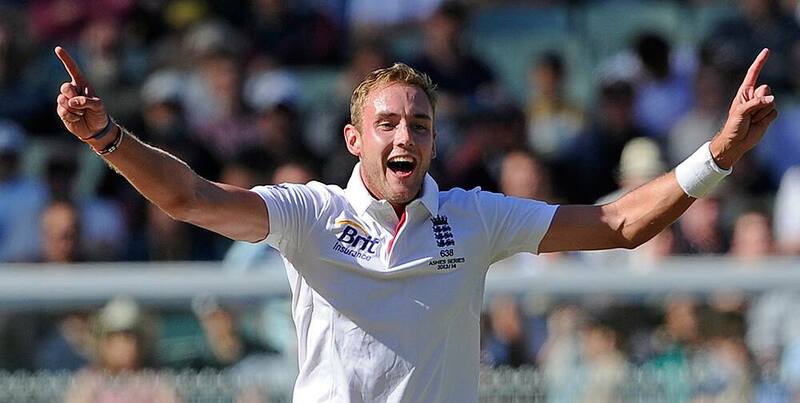 England Stuart Broad, celebrates after taking the wicket of Australia's Ryan Harris for 6 runs during their Ashes cricket test match at the Melbourne Cricket Ground in Melbourne, Australia. 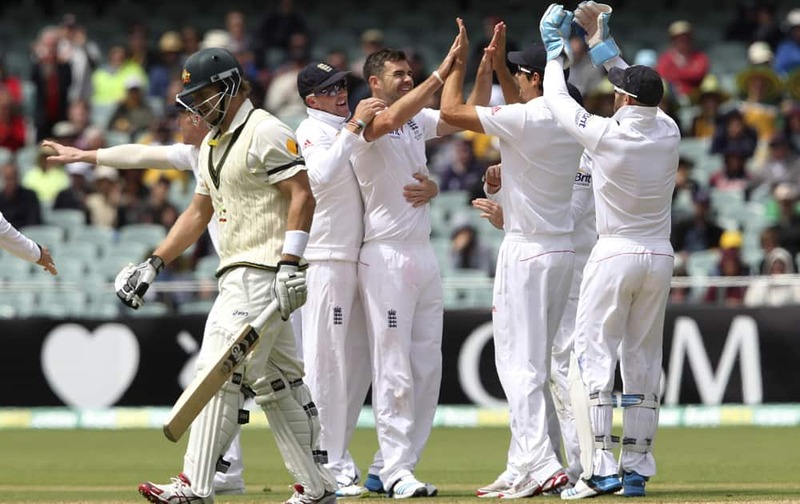 England Tim Bresnan celebrates with teammates James Anderson and Joe Root after taking the wicket of Australia's Mitchell Johnson for 2 runs during their Ashes cricket test match at the Melbourne Cricket Ground in Melbourne, Australia. 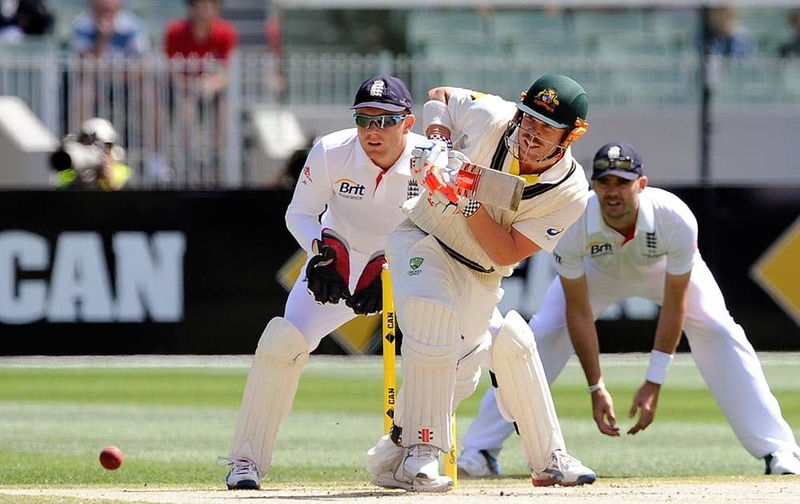 Australia's Brad Haddin plays a shot against England during their Ashes cricket test match at the Melbourne Cricket Ground in Melbourne, Australia. 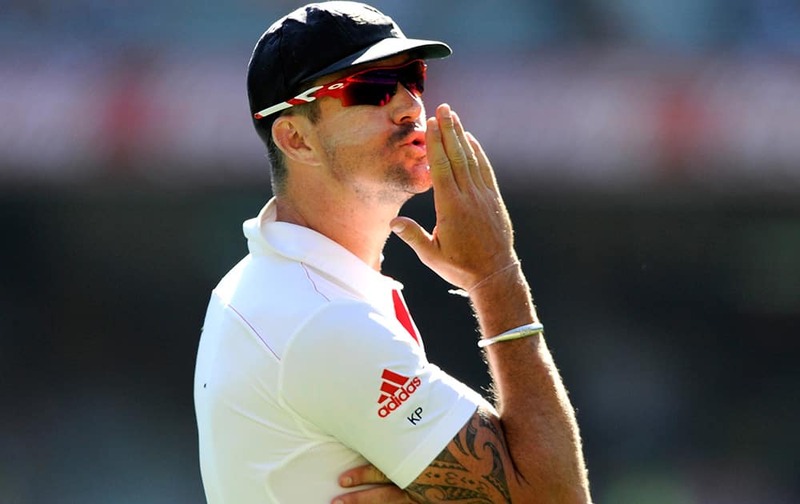 England's Kevin Pietersen blows a kiss while fielding against Australia during their Ashes cricket test match at the Melbourne Cricket Ground in Melbourne, Australia. 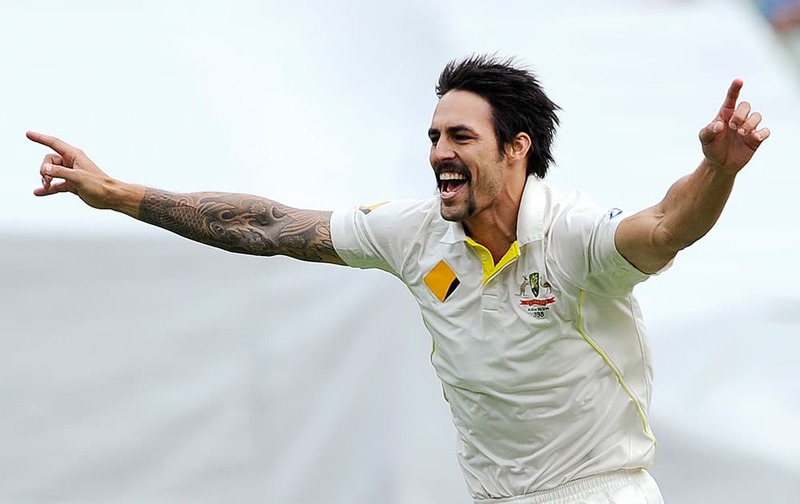 Australia's Mitchell Johnson plays a shot against England during their Ashes cricket test match at the Melbourne Cricket Ground in Melbourne, Australia. 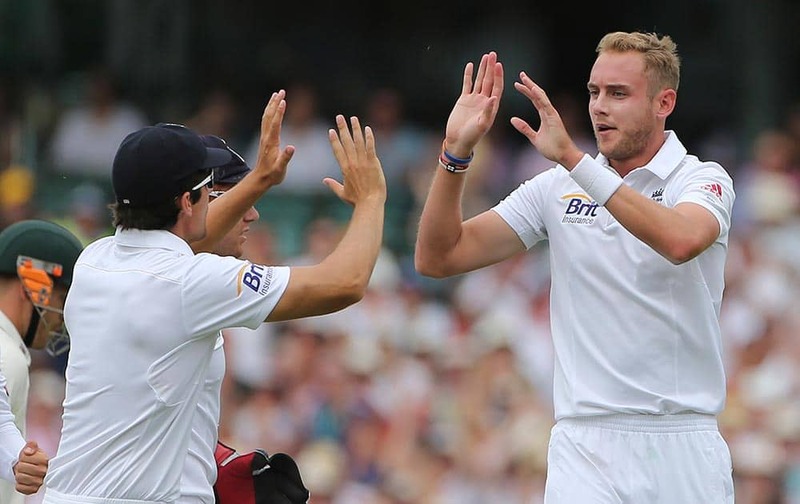 England's Stuart Broad celebrates with teammate James Anderson after taking the wicket of Australia's Steve Smith for 19 runs during their Ashes cricket test match at the Melbourne Cricket Ground in Melbourne, Australia. 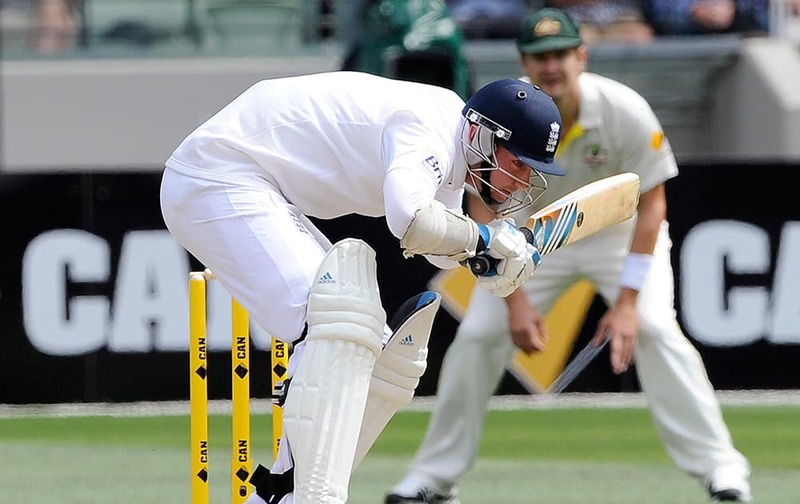 England's Tim Bresnan collides with Australia's Steve Smith during their Ashes cricket test match at the Melbourne Cricket Ground in Melbourne, Australia. 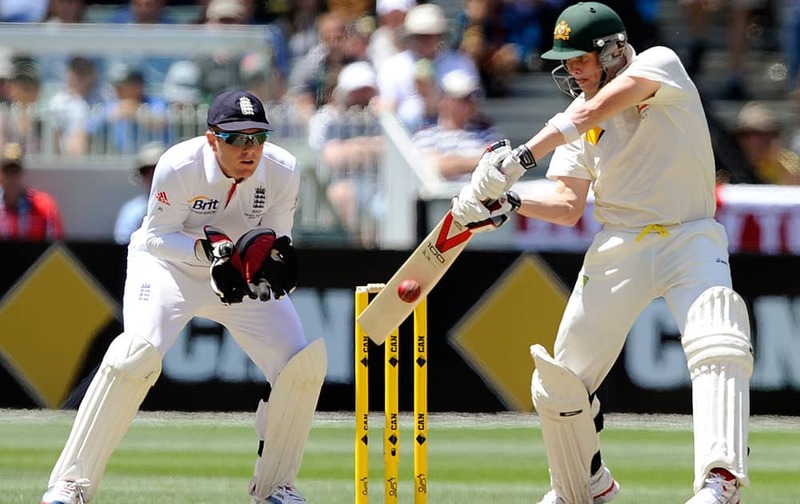 England's Jonny Bairstow is set as Australia's Steve Smith plays a shot during their Ashes cricket test match at the Melbourne Cricket Ground in Melbourne, Australia. 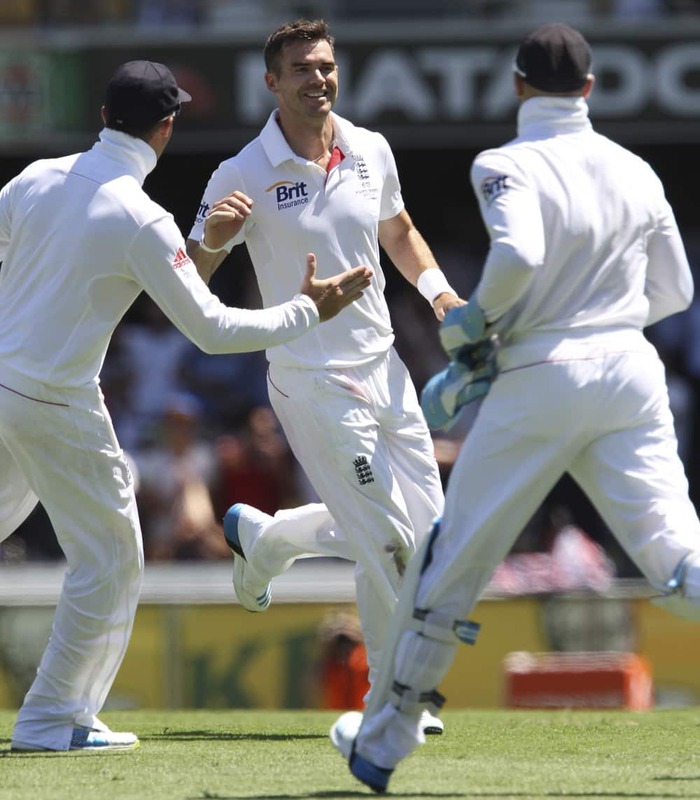 England's James Anderson celebrates with teammates after bowling out Australia's Michael Clarke for 10 runs during their Ashes cricket test match at the Melbourne Cricket Ground in Melbourne, Australia. 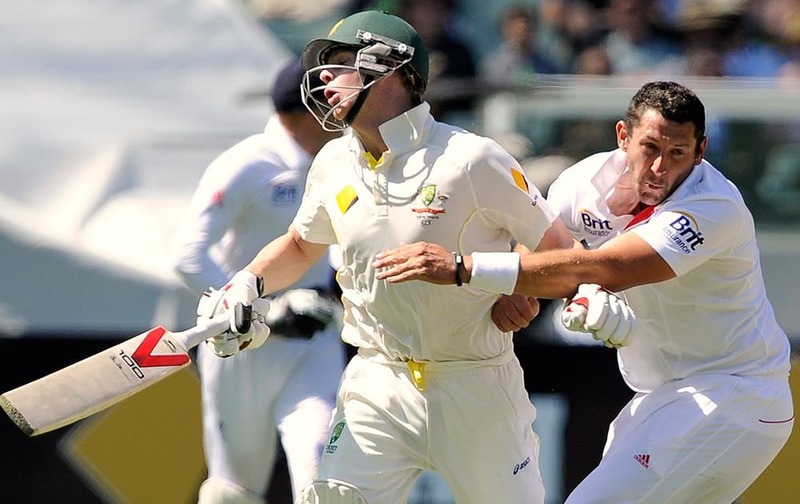 Australia's Chris Rogers is struck on the head off the bowling of England's Stuart Broad, left, during their Ashes cricket test match at the Melbourne Cricket Ground in Melbourne, Australia. 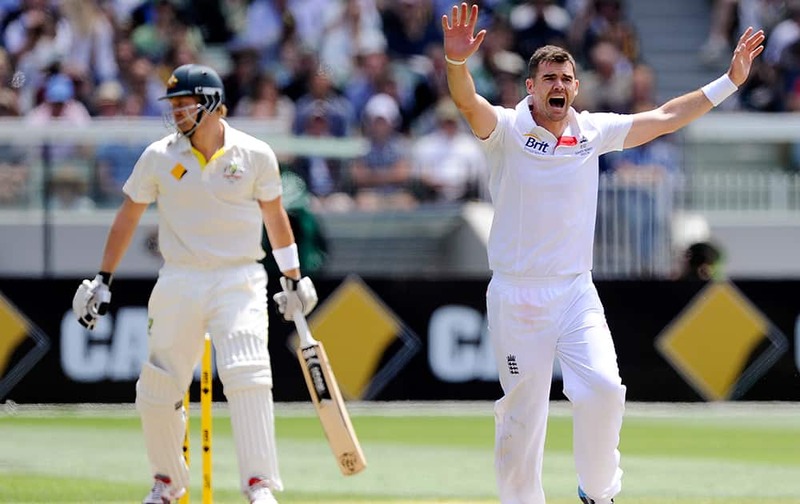 England's James Anderson raises his arms as he appeals for a decision on Australia's Shane Watson, left, during their Ashes cricket test match at the Melbourne Cricket Ground in Melbourne, Australia. 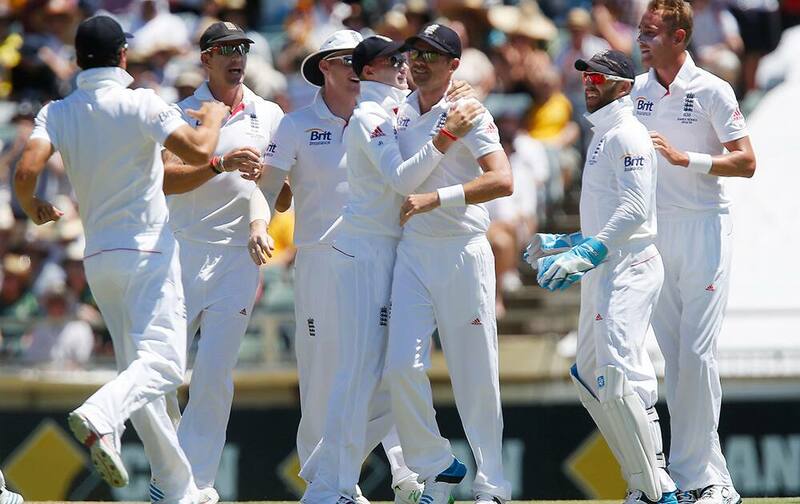 England made 255 runs in their first innings. 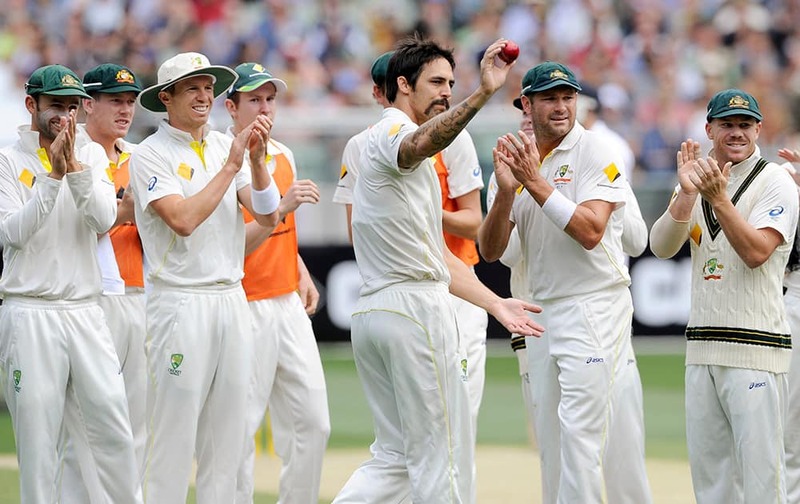 Australia's Mitchell Johnson holds up the ball after taking 5 wickets against England during their Ashes cricket test match at the Melbourne Cricket Ground in Melbourne, Australia. 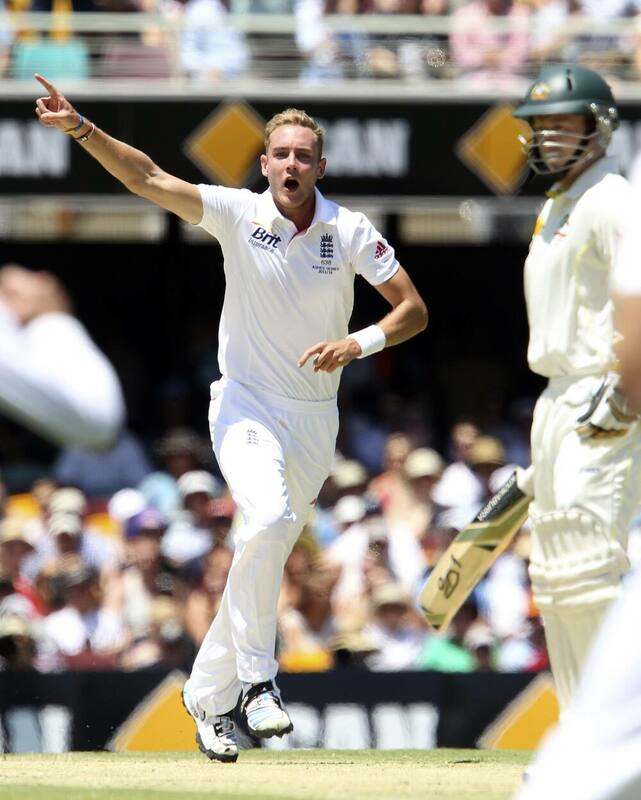 England's Stuart Broad ducks under a high delivery from Australia's Ryan Harris during their Ashes cricket test match at the Melbourne Cricket Ground in Melbourne, Australia. 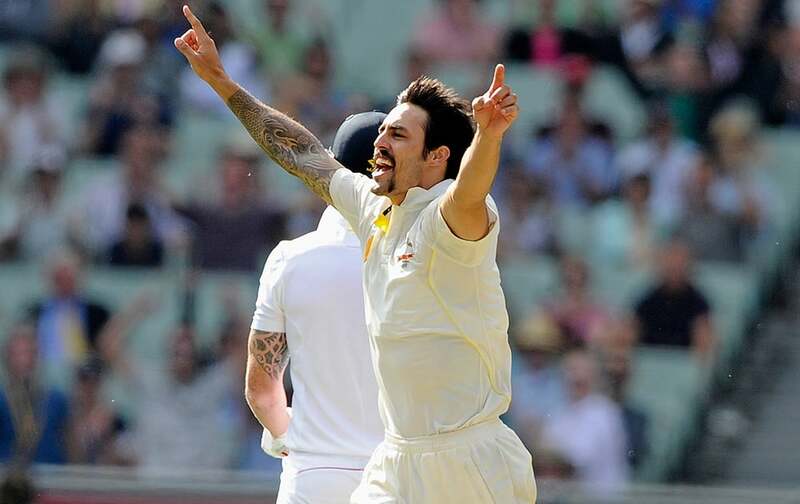 Australia's Mitchell Johnson celebrates the wicket of England's Tim Bresnan for 1 run during their Ashes cricket test match at the Melbourne Cricket Ground in Melbourne, Australia. 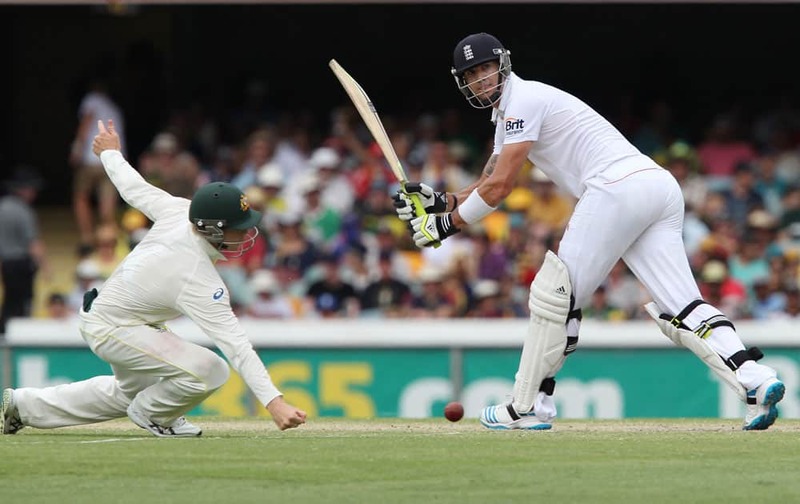 England's Kevin Pietersen is bowled out by Australia's Mitchell Johnson for 71 runs on the second day of their fourth Ashes cricket test match at the Melbourne Cricket Ground in Melbourne, Australia. 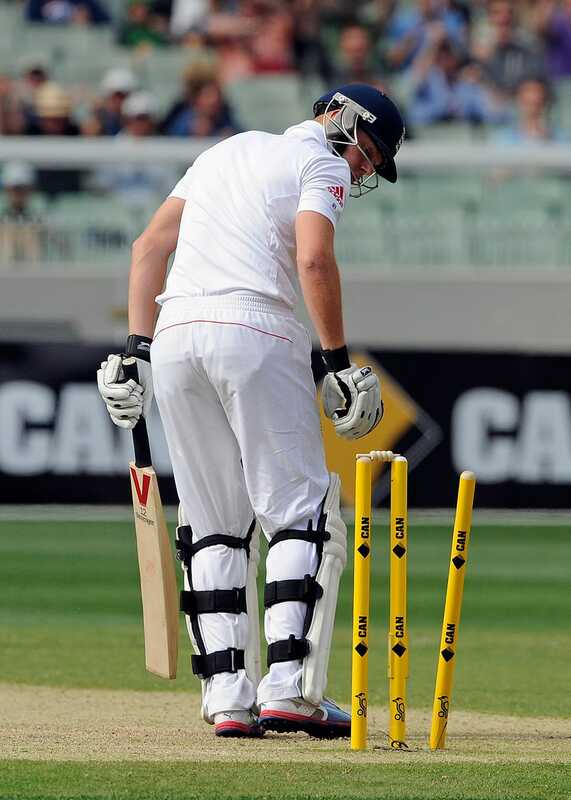 England's Jonny Bairstow looks at his stumps after being bowled by Australia's Mitchell Johnson on the first day of their Ashes cricket test match at the Melbourne Cricket Ground in Melbourne, Australia. 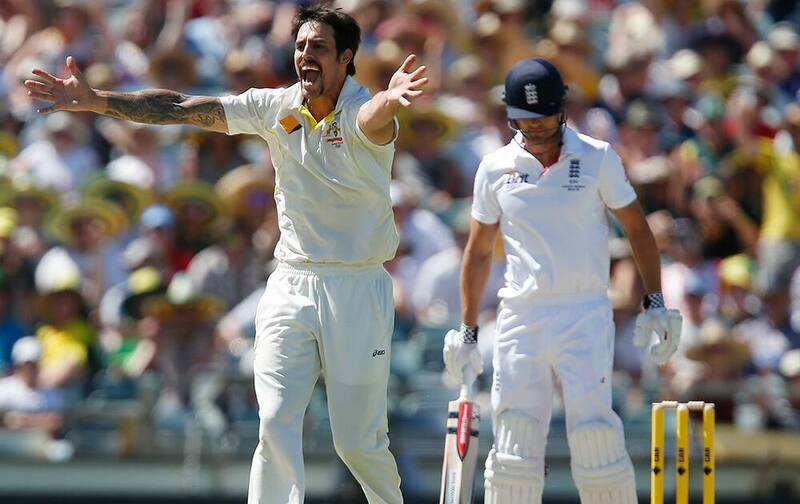 Australia's Mitchell Johnson celebrates the wicket of England's Ben Stokes on the first day of their Ashes cricket test match at the Melbourne Cricket Ground in Melbourne, Australia. 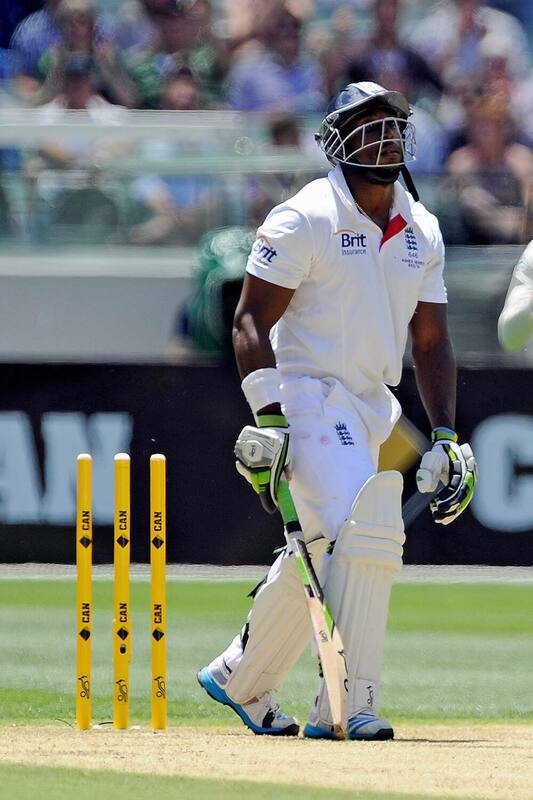 England's Michael Carberry looks up after being bowled by Australia's Shane Watson on the first day of their Ashes cricket test match at the Melbourne Cricket Ground in Melbourne, Australia. 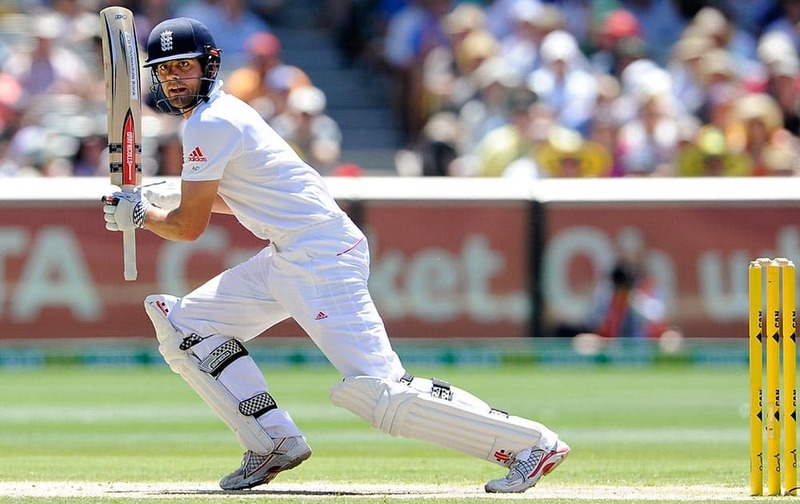 England's Alastair Cook plays a stroke on the first day of their Ashes cricket test match against Australia at the Melbourne Cricket Ground in Melbourne, Australia. 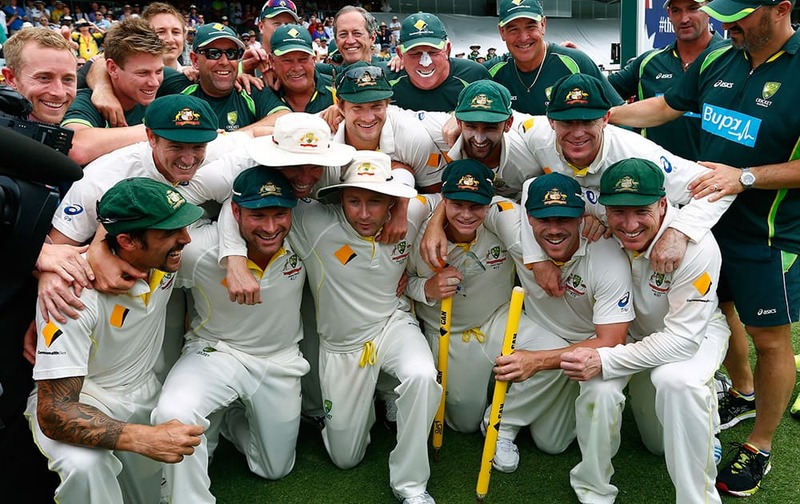 Australian team poses for group photo after winning their Ashes cricket test match over England in Perth, Australia. 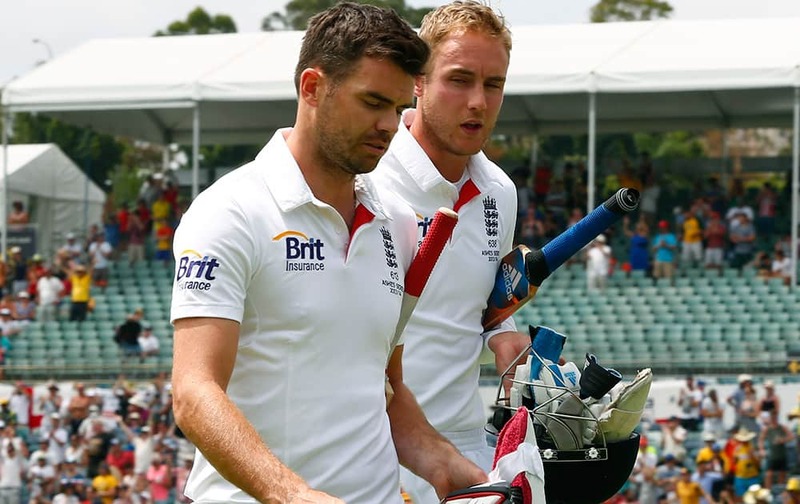 England's James Anderson and teammate Stuart Broad leave the ground after Australia defeated England in their Ashes cricket test match in Perth, Australia. 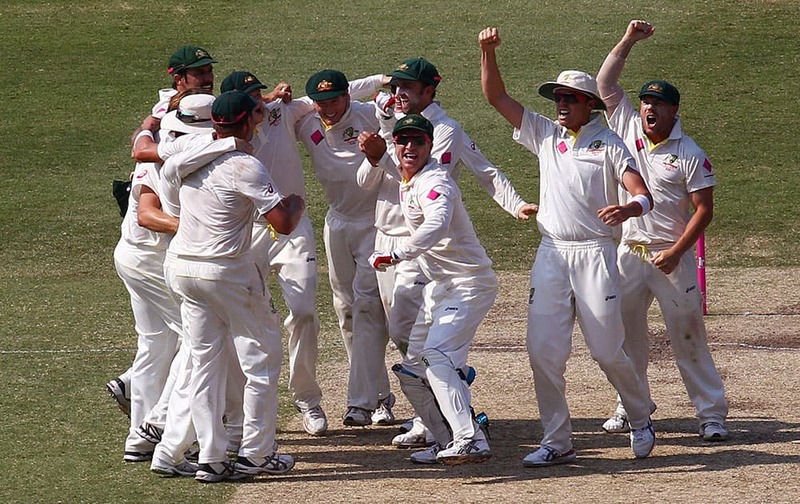 Australian team players celebrate after winning their Ashes cricket test match over England. 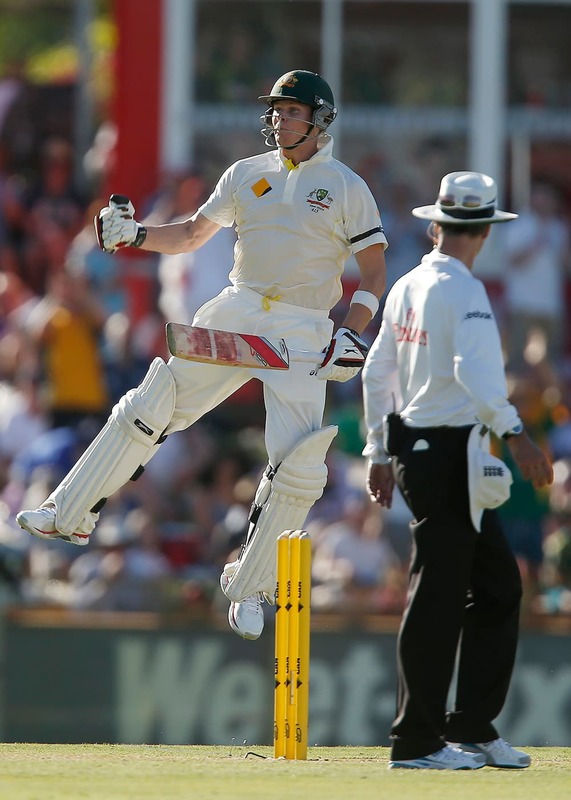 Australia's Brad Haddin jumps in the air after taking a catch on the fifth day of their Ashes cricket test match against England in Perth, Australia. 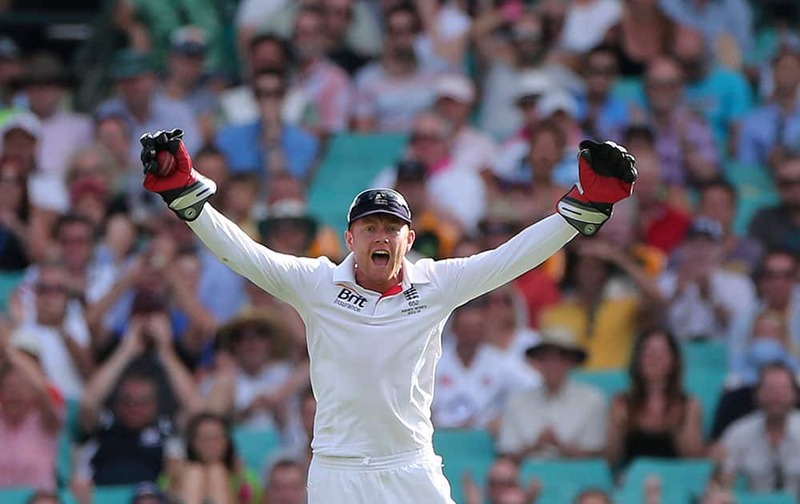 England's Ben Stokes raises his arm after scoring a century on the fifth day of their Ashes cricket test match against Australia in Perth, Australia. 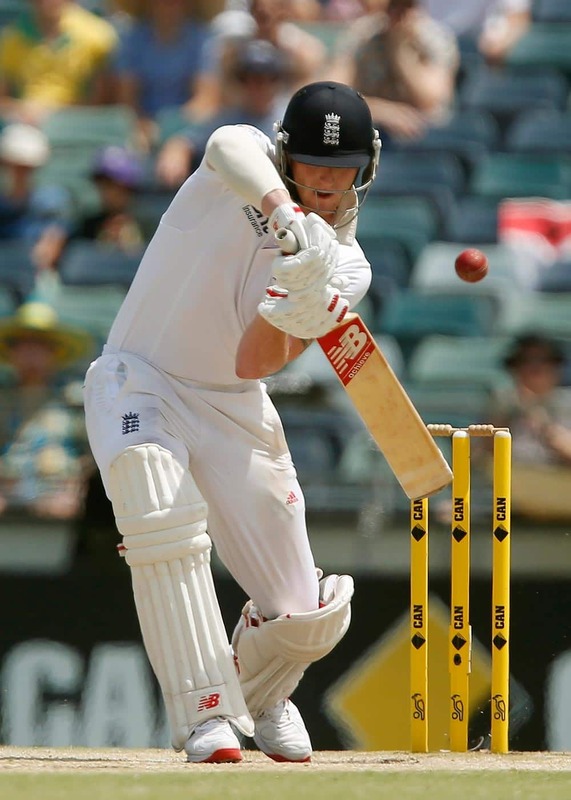 England's Ben Stokes plays a stroke on the fifth day of their Ashes cricket test match against Australia in Perth, Australia. 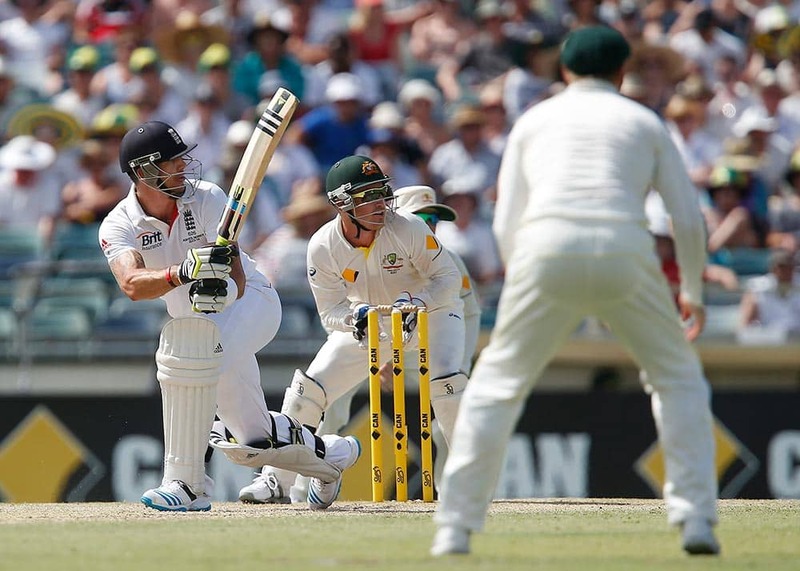 England's Kevin Pietersen, left, plays a sweep shot during England's second innings on the fourth day of their Ashes cricket test match against Australia in Perth, Australia. 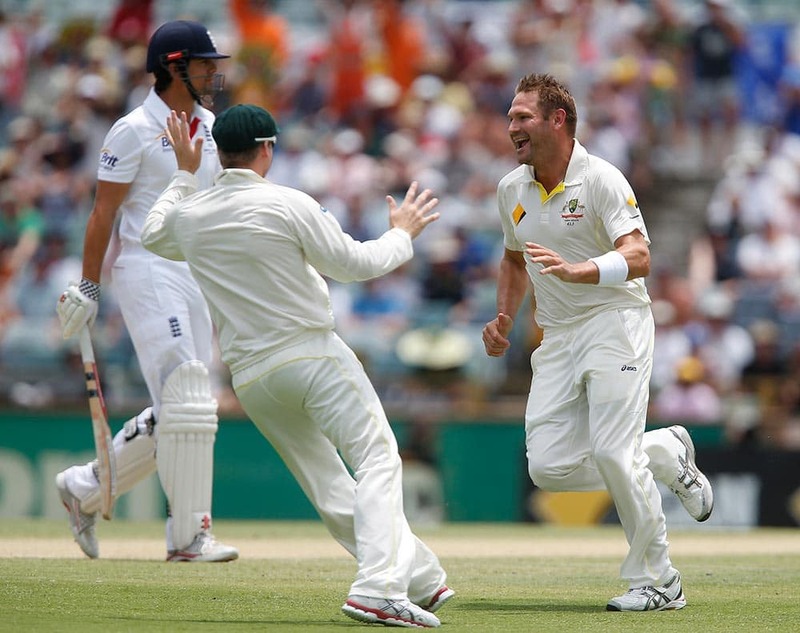 Australia's Ryan Harris, right, celebrates with his teammate, center, after taking the wicket of England's Alastair Cook, left, during England's second innings on the fourth day of their Ashes cricket test match in Perth, Australia. 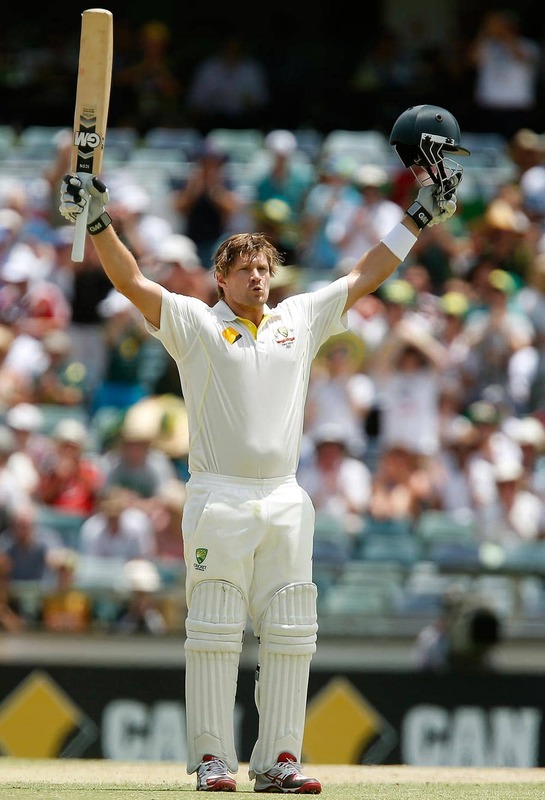 Australia's Shane Watson throws his arms up in celebration after scoring a test century during Australia's second innings on the fourth day of their Ashes cricket test match against Australia in Perth, England. 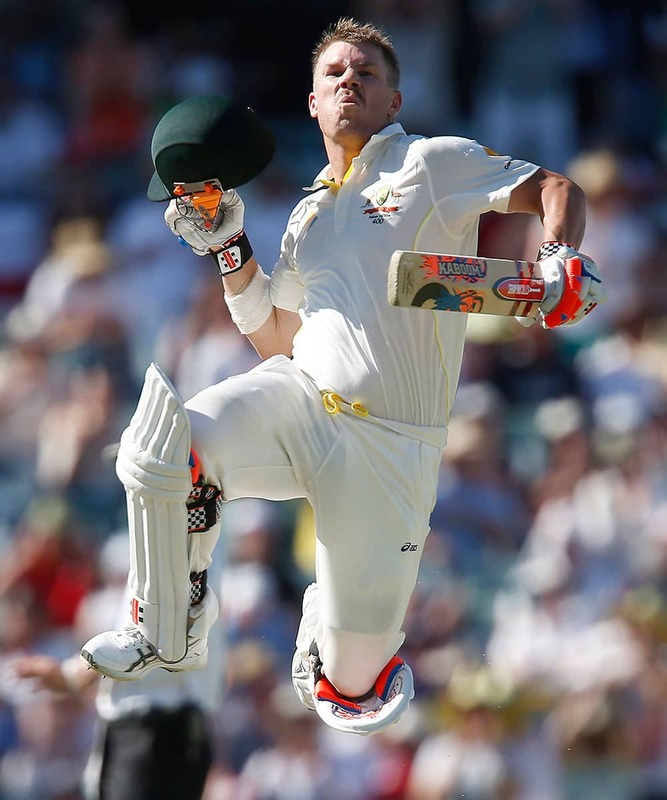 Australia's Dave Warner leaps into the air after scoring a century in the second innings on the third day of their Ashes cricket test match against England in Perth, Australia. 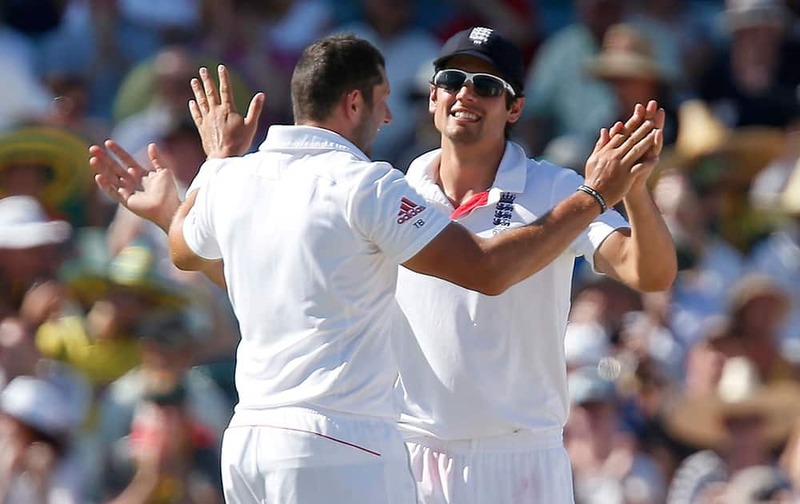 England's Alastair Cook, right, congratulates teammate Tim Bresnan after Bresnan took the wicket of Australia's Chris Rodgers in the second innings on the third day of their Ashes cricket test match in Perth, Australia. 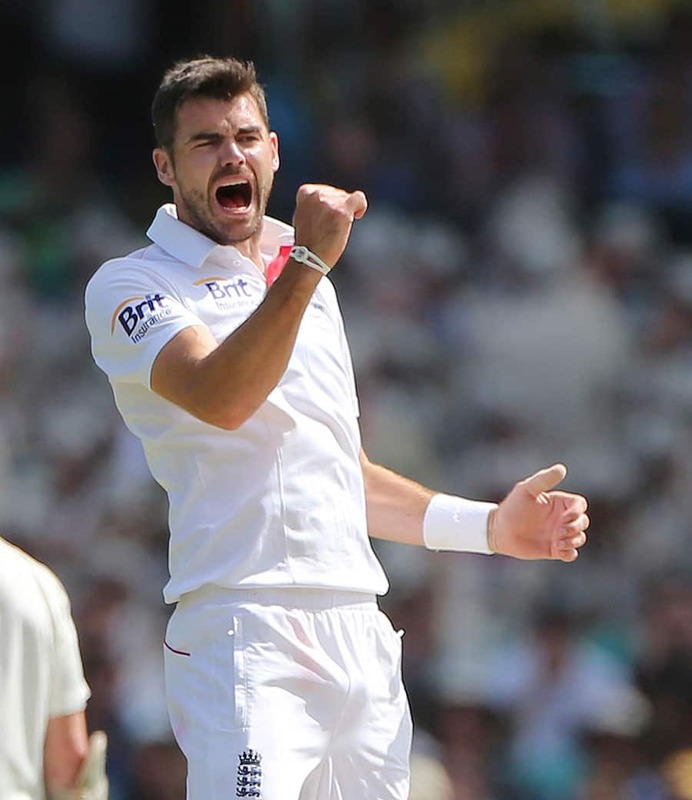 England's James Anderson appeals for a wicket during Australia's second innings on the third day of their Ashes cricket test match in Perth, Australia. 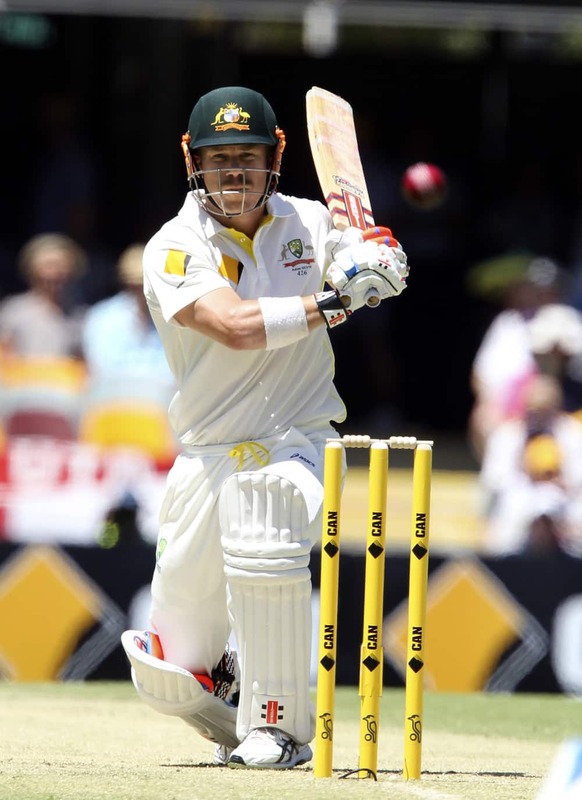 Australia's Dave Warner ducks from a short pitch ball during Australia's second innings on the third day of their Ashes cricket test match against England in Perth, Australia. 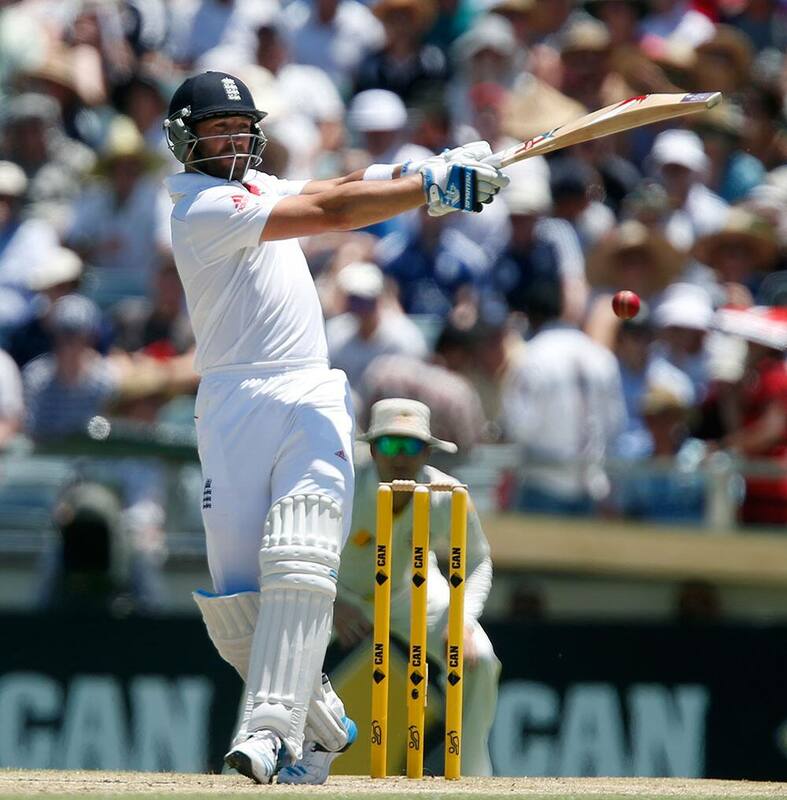 England's Matt Prior plays a hook shot on the third day of their Ashes cricket test match against Australia in Perth. 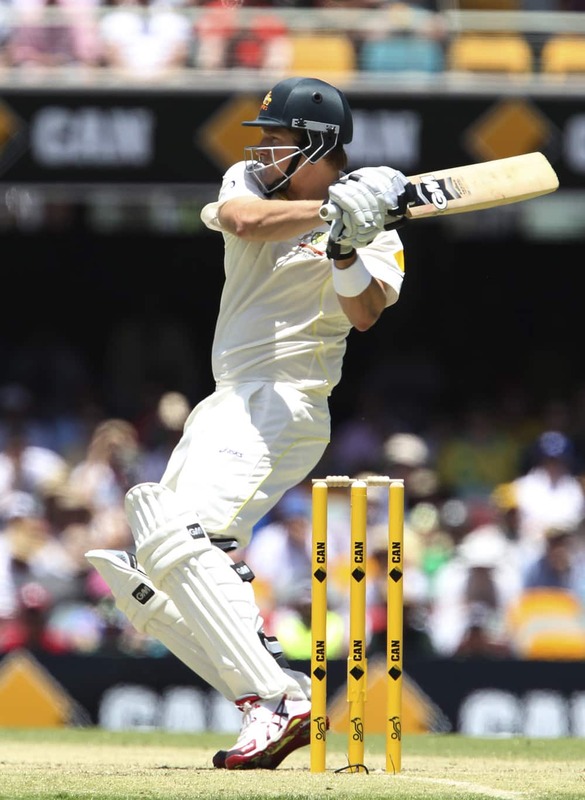 Australia's Ryan Harris appeals for a lbw on the third day of their Ashes cricket test match against England in Perth. 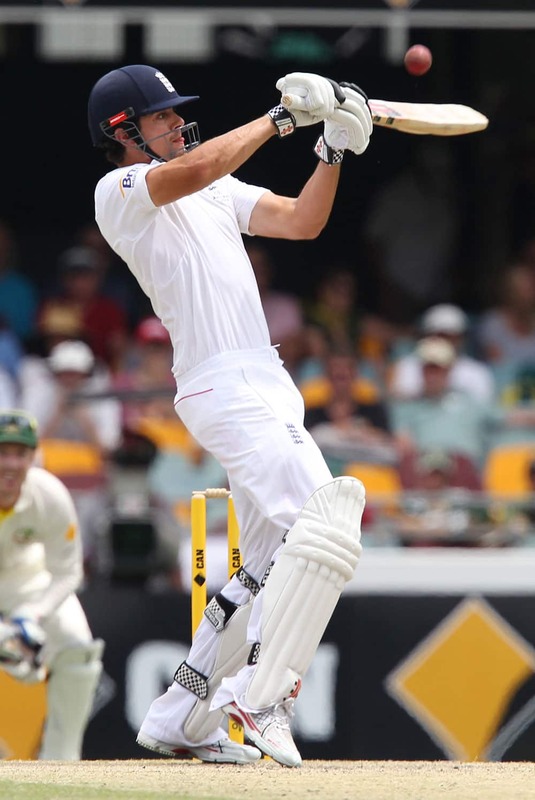 England's Alastair Cook plays a cut shot against Australia during his innings of 72 runs on the second day of their Ashes cricket test match in Perth, Australia. England's Kevin Pietersen walks back to the pavilion after being caught out for 19 runs on the second day of their Ashes cricket test match against Australia in Perth, Australia. 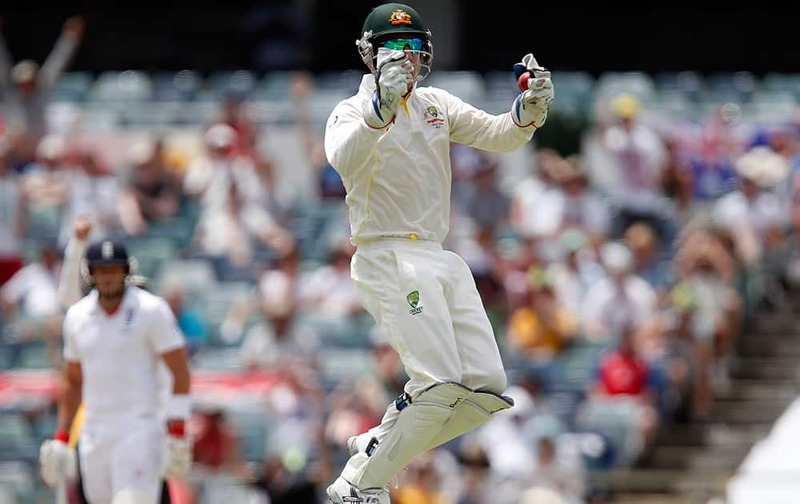 Australia's Dave Warner throws his arms in the air after taking the catch to dismiss England's Alastair Cook for 72 runs on the second day of their Ashes cricket test match in Perth, Australia. 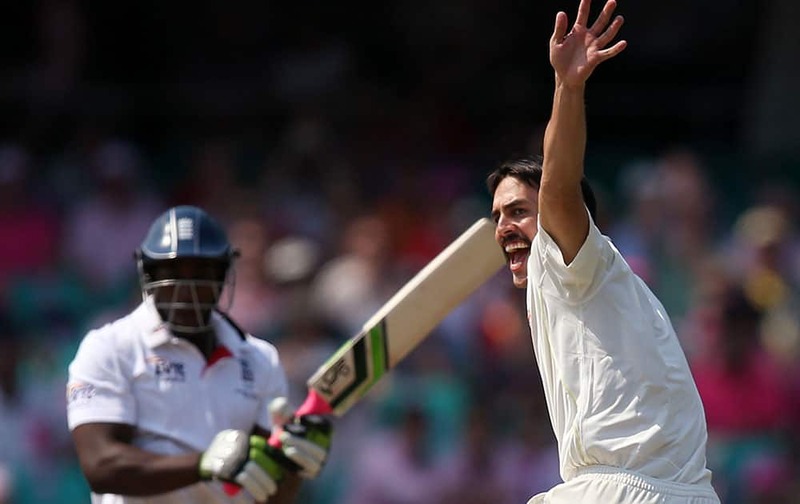 Australia's Mitchell Johnson appeals for an lbw against England's Alastair Cook on the second day of their Ashes cricket test match in Perth, Australia. 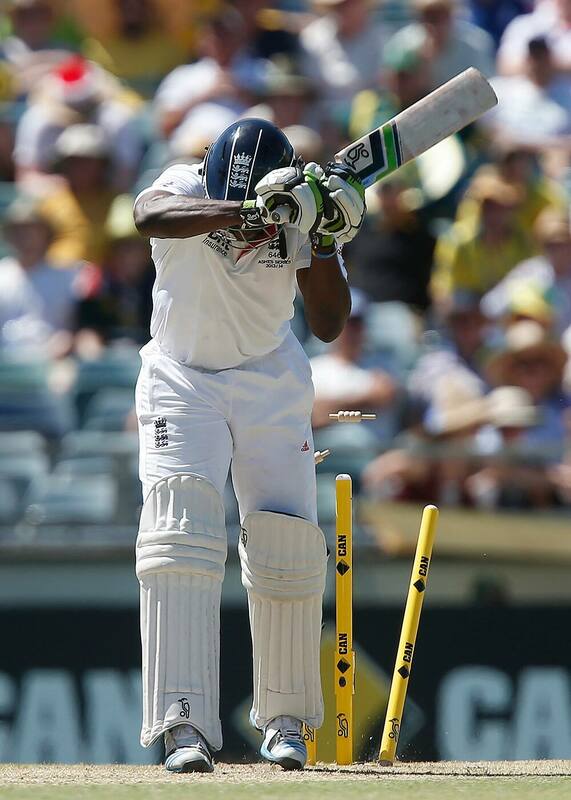 England's Michael Carberry is bowled by Australia's Ryan Harris for 43 runs on the second day of their Ashes cricket test match against Australia in Perth, Australia. Australia's Steve Smith jumps in the air to celebrate scoring 100 runs against England on the first day of their Ashes cricket test match in Perth, Australia. England's Ben Stokes is congratulated by teammates after taking the wicked of Australia's Brad Haddin on the first day of their Ashes cricket test match in Perth, Australia. 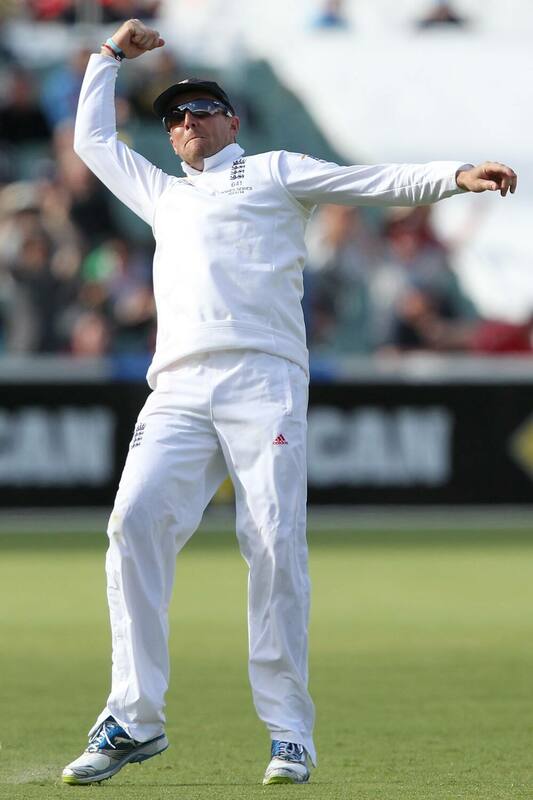 Australia's Brad Haddin acknowledges the crowd after scoring 50 runs on the first day of play during the Ashes test match against England in Perth, Australia. 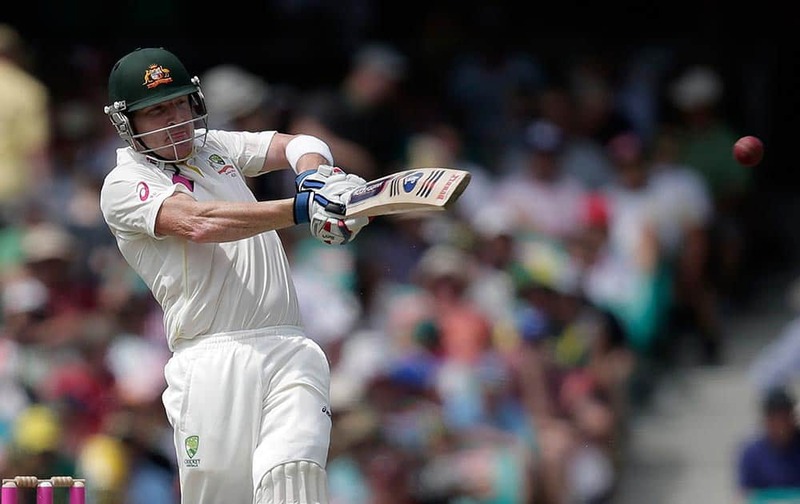 Australia's Brad Haddin plays a pull shot on the first day of play during the Ashes test match against England in Perth, Australia. 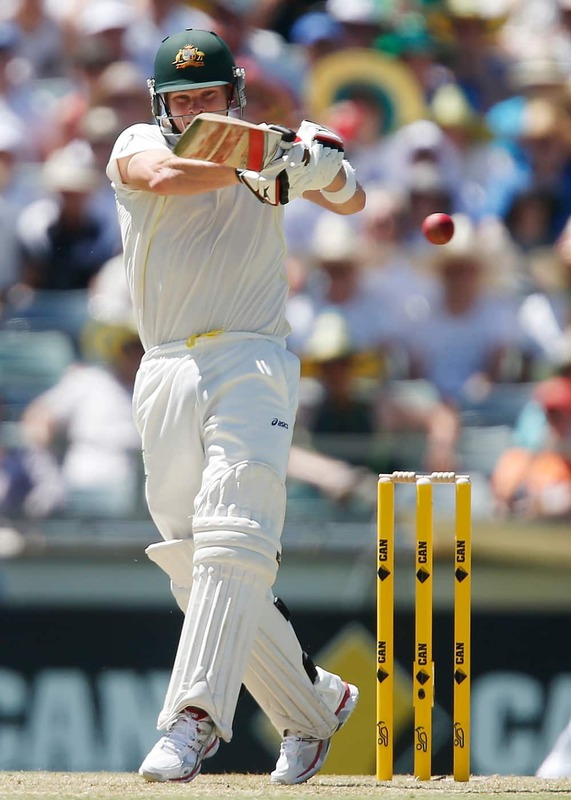 Australia's Steve Smith plays a hook shot against England on the first day of their Ashes cricket test match in Perth, Australia. 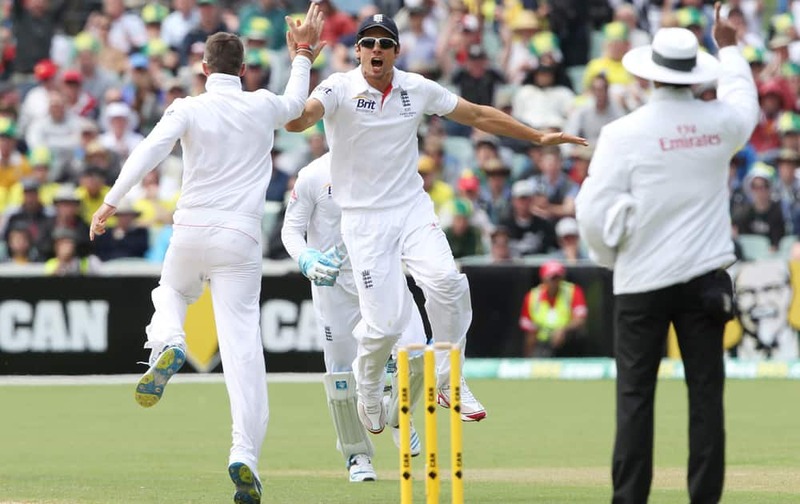 England's Graeme Swann and Alastair Cook celebrate after taking the wicket of Australia's Michael Clarke on the first day of the Ashes cricket test match in Perth, Australia. 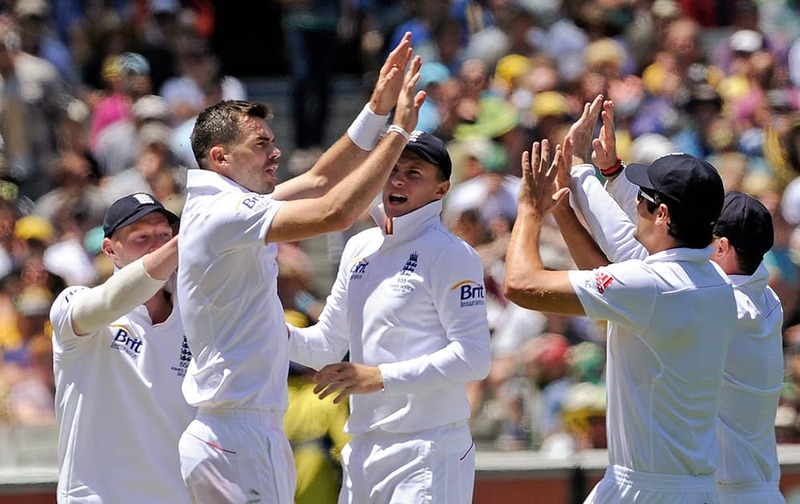 England's Kevin Pietersen is congratulated by team mates after taking the catch of Australia's George Bailey on the first day of the Ashes cricket test match in Perth, Australia. 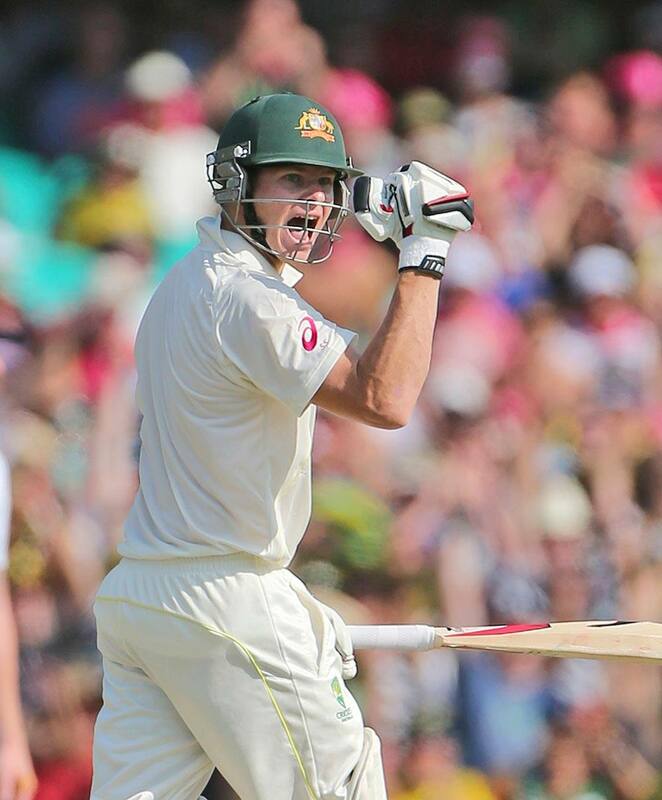 Australia's Steve Smith plays a shot on the first day of the Ashes cricket test match against England in Perth, Australia. 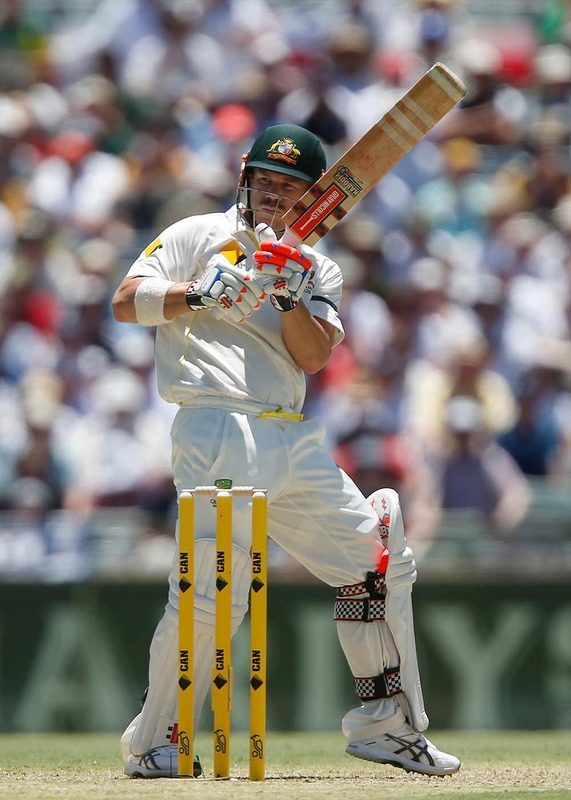 Australia's Dave Warner plays a hook shoot on the first day of the Ashes cricket test match against England in Perth, Australia. 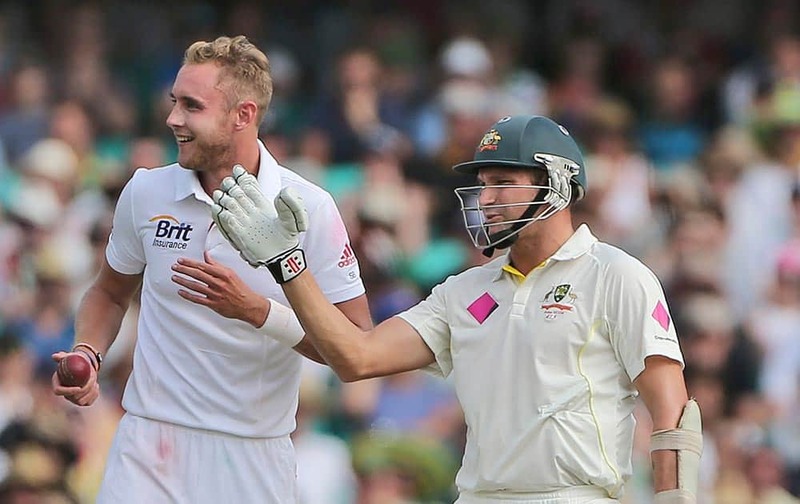 England's James Anderson, center right, is congratulated by team mate Joe Root after running out Australia's Chris Rodgers on the first day of the Ashes cricket test match against Australia in Perth, Australia. 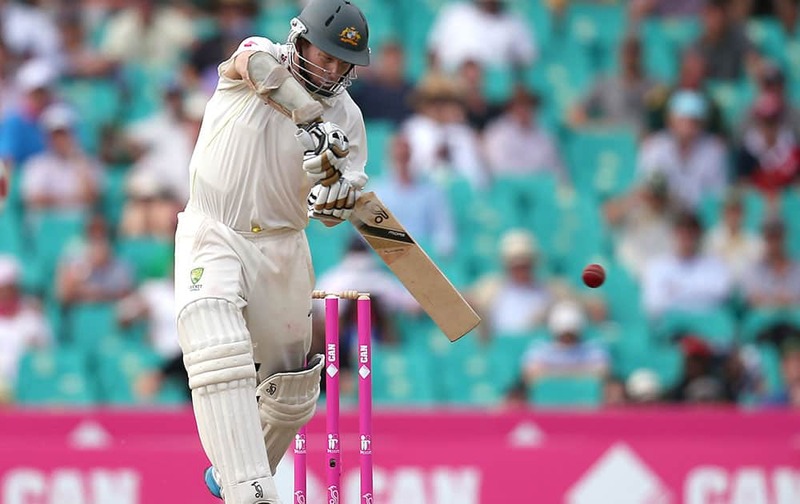 Australia's Michael Clarke drives the ball in front of England's Matt Prior during the second Ashes cricket test match between England and Australia, Adelaide, in Australia. 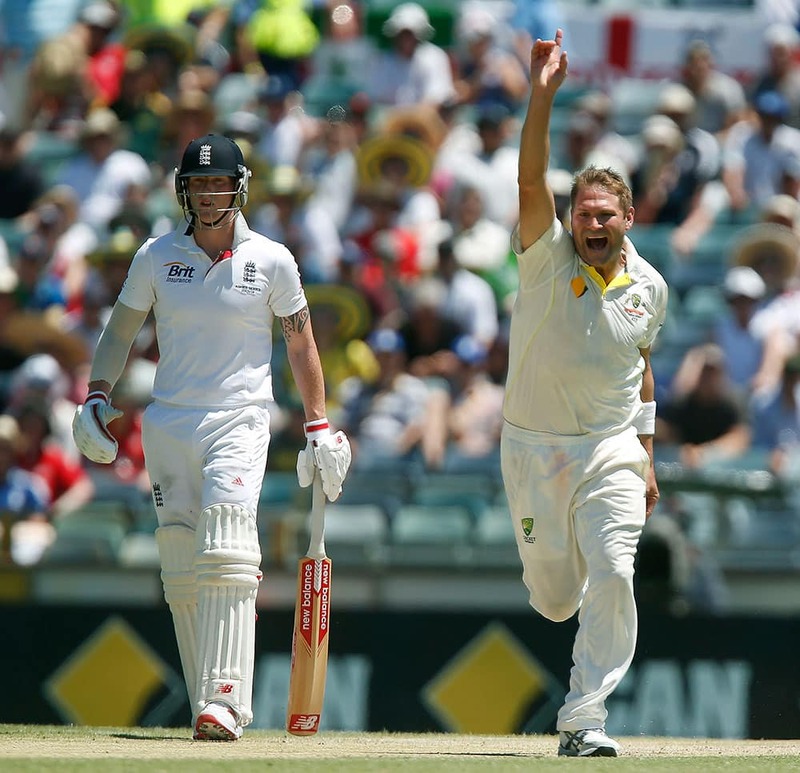 England's Stuart Broad unsuccessfully appeals for LBW against Australia's Ryan Harris during the second Ashes cricket test match between England and Australia, in Adelaide. 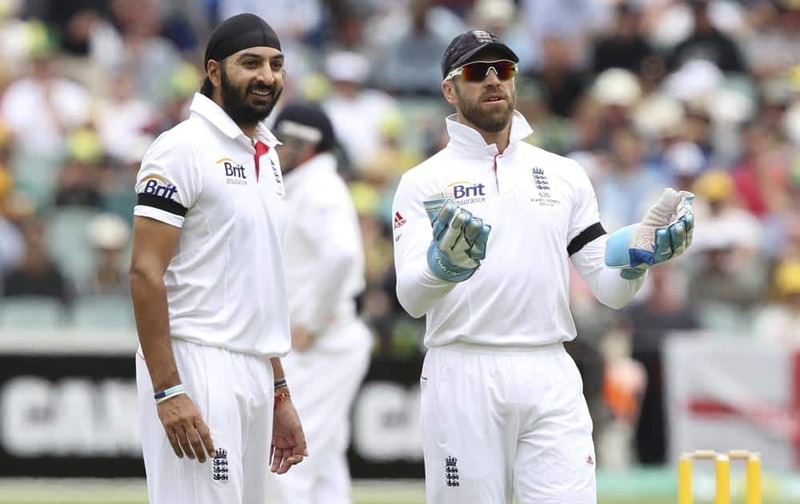 England cricket wicket keeper Matt Prior, right, waits to catch the ball as bowler Monty Panesar looks on during play on the second day of the second Ashes cricket test match against Australia in Adelaide. 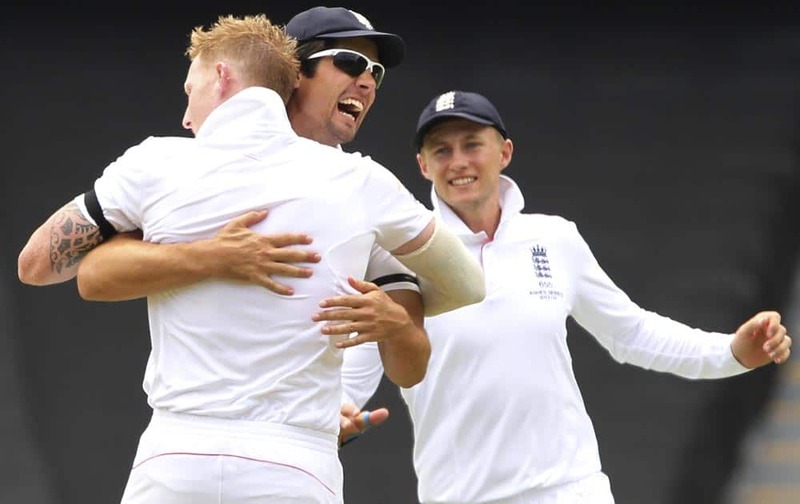 England's Ben Stokes, left, Alistair Cook, center, and Joe Root celebrate the wicket of Brad Haddin but was ruled a no ball and not out during the second Ashes cricket test match between England and Australia, in Adelaide. 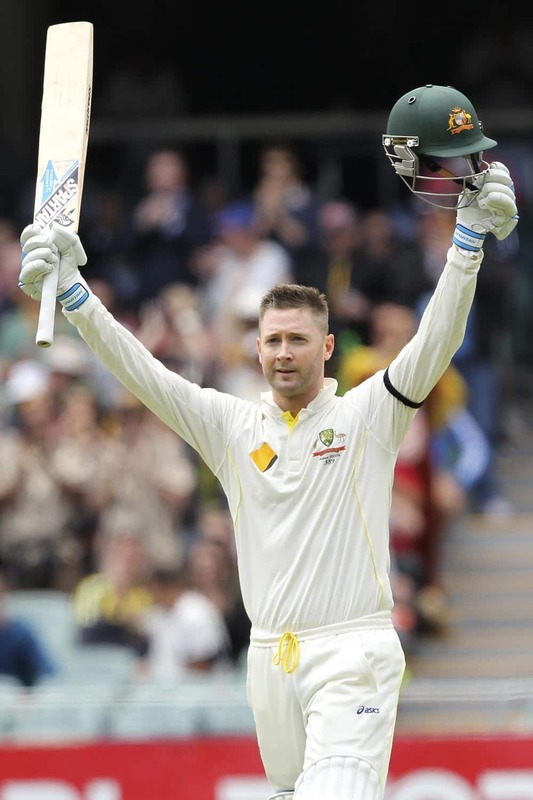 Australia's Michael Clarke celebrates scoring a century during the second Ashes cricket test match between England and Australia. 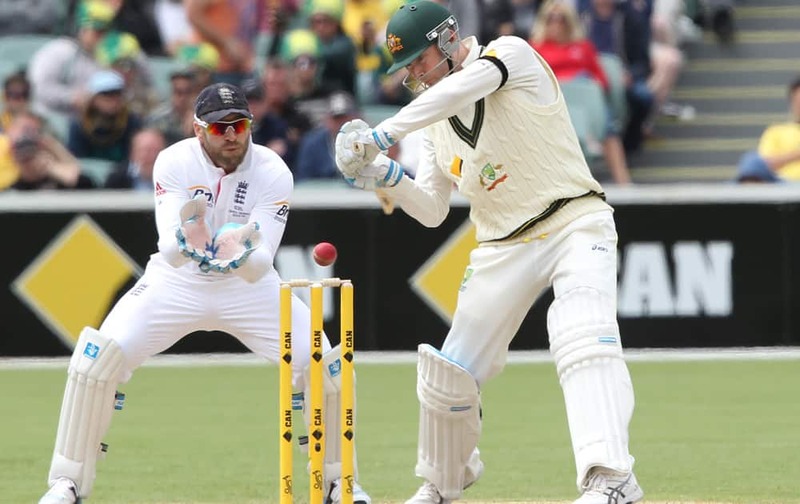 Michael Clarke cuts the ball in front of England's Matt Prior during the second Ashes cricket test match between England and Australia, in Adelaide, Australia. 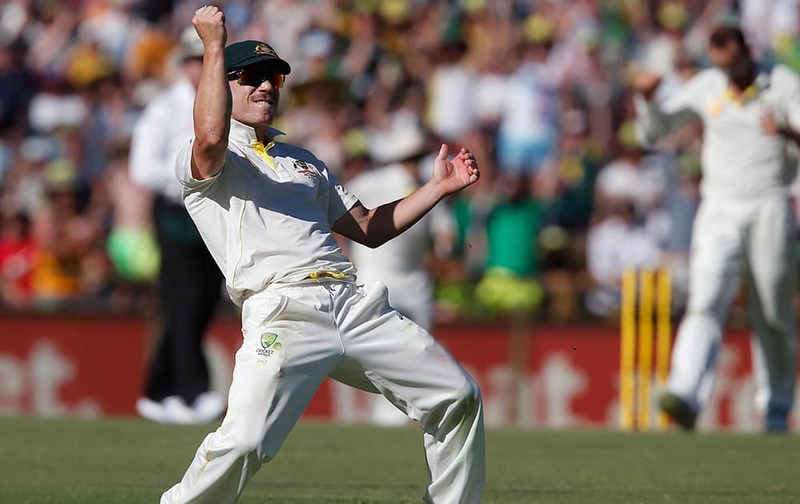 Graeme Swan celebrates after taking Australia's George Bailey caught during their second Ashes cricket test match in Adelaide, Australia. 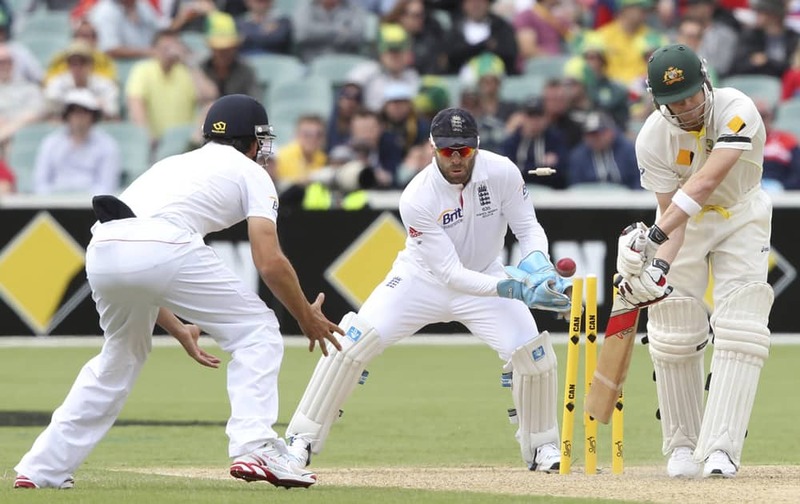 Steven Smith is bowled as England's Alistair Cook and Matt Prior field during their second Ashes cricket test match in Adelaide, Australia. Graeme Swann and Alistair Cook celebrate the wicket of Australia's Chris Rogers during their second Ashes cricket test match in Adelaide, Australia. 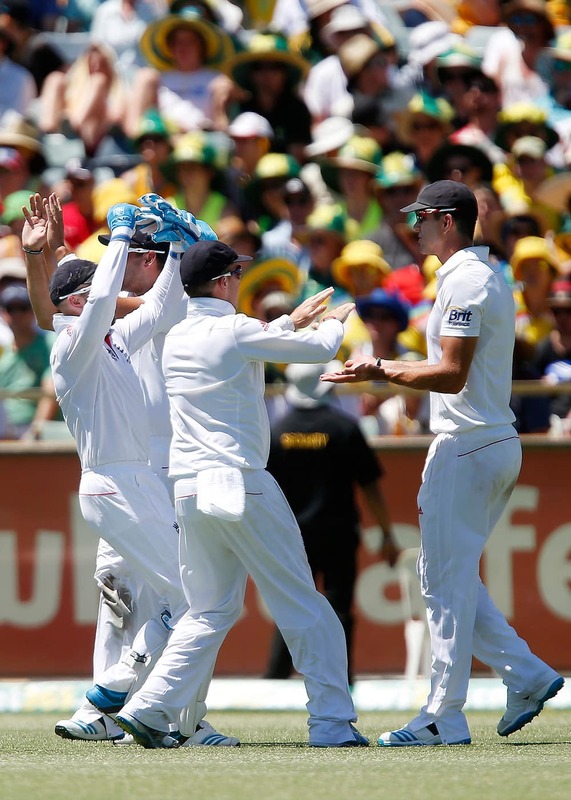 England players celebrate the wicket of Australia's Shane Watson during their second Ashes cricket test match in Adelaide, Australia. 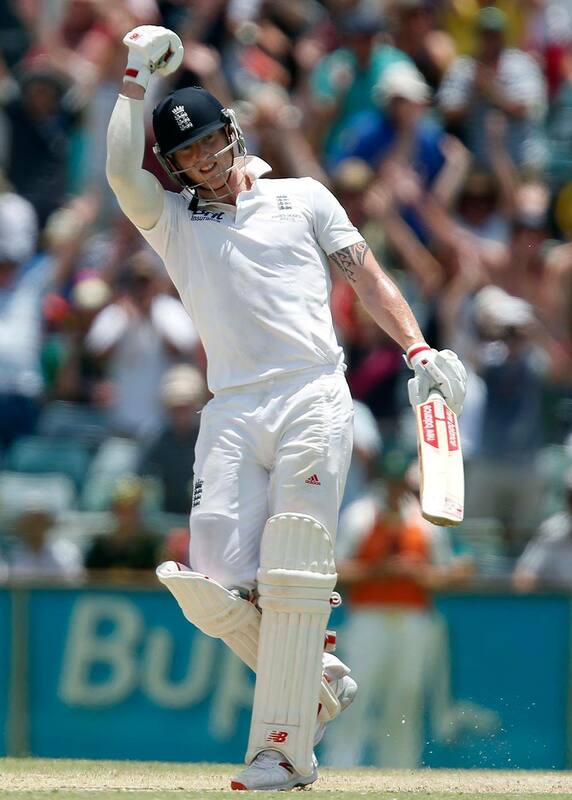 Chris Rogers celebrates his fifty during their second Ashes cricket test match against England in Adelaide, Australia. 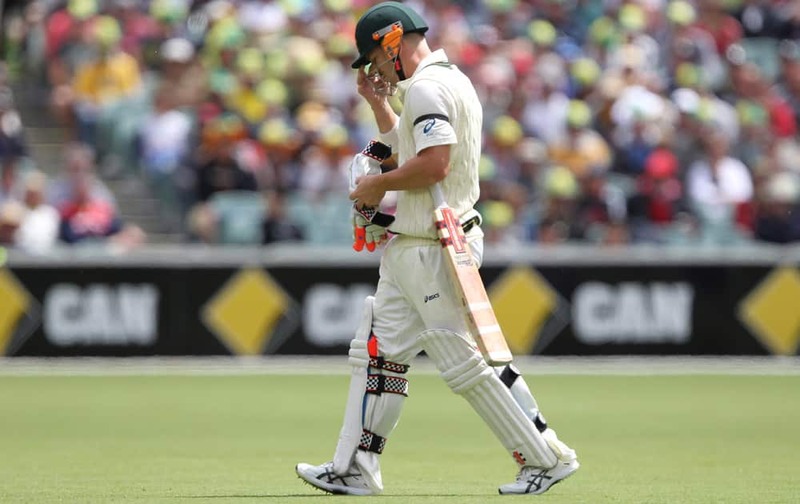 Australia's David Warner walks after losing his wicket during the second Ashes cricket test match between England and Australia, in Adelaide, Australia. Australia's Mitchell Johnson, Michael Clarke and David Warner, celebrate the wicket of England's Stuart Broad, on the fourth day of the series-opening Ashes cricket test between England and Australia at the Gabba in Brisbane. 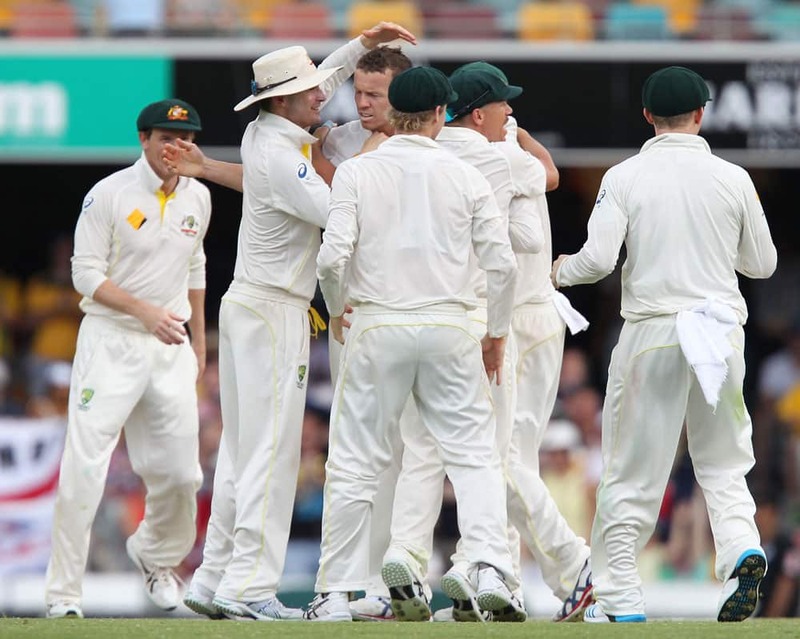 Australia's Peter Siddle, center, without a cap, celebrates with his team after getting the wicket of England's Ian Bell on the fourth day of the series-opening Ashes cricket test between England and Australia at the Gabba in Brisbane. 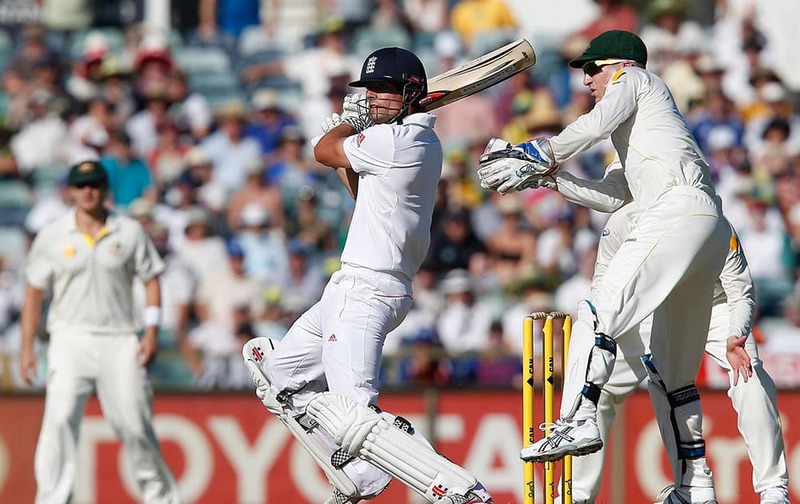 England's Alastair Cook plays a shot on the fourth day of the series-opening Ashes cricket test between England and Australia at the Gabba in Brisbane. 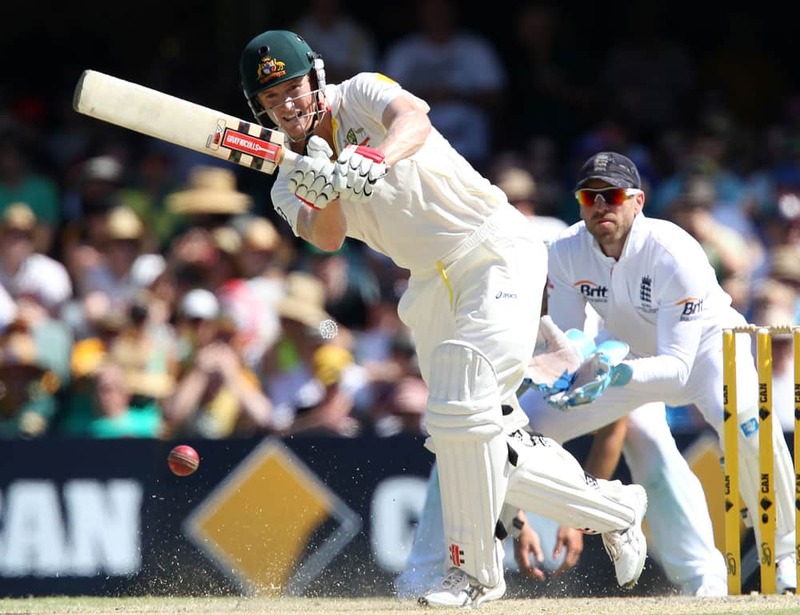 England's Kevin Pietersen, right, plays a shot past Australia's Steven Smith, left, on the fourth day of the series-opening Ashes cricket test between England and Australia at the Gabba in Brisbane. 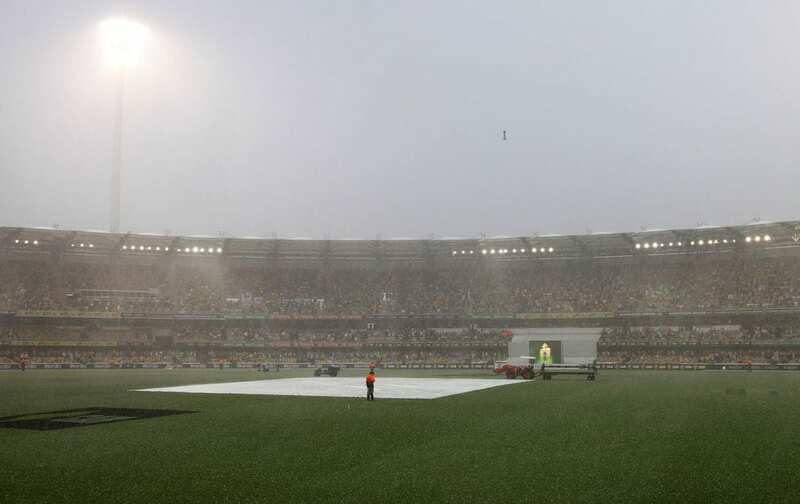 A security guard watches the pitch during a rain storm that interrupted play on the fourth day of the series-opening Ashes cricket test between England and Australia at the Gabba in Brisbane. 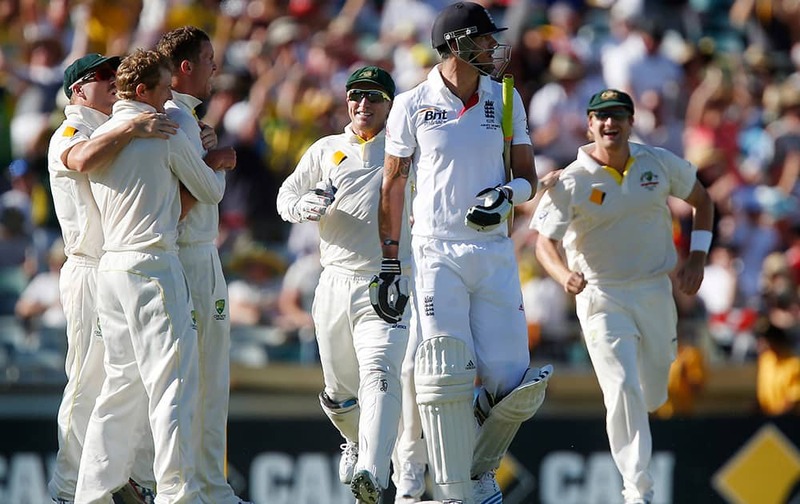 Australia celebrate after the wicket of England's Jonathan Trott, on the third day of the series-opening Ashes cricket test at the Gabba in Brisbane, Australia. 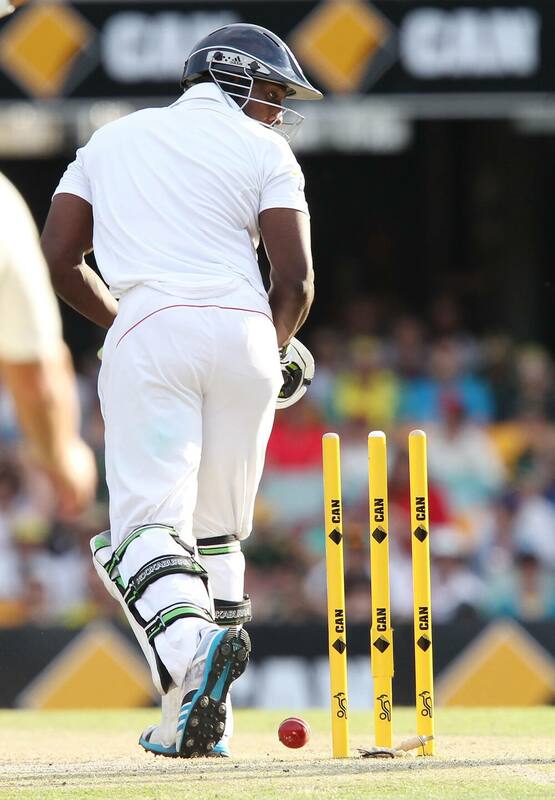 Michael Carberry looks back at his stumps after he was bowled out by Ryan Harris on the third day of the series-opening Ashes cricket test at the Gabba in Brisbane, Australia. 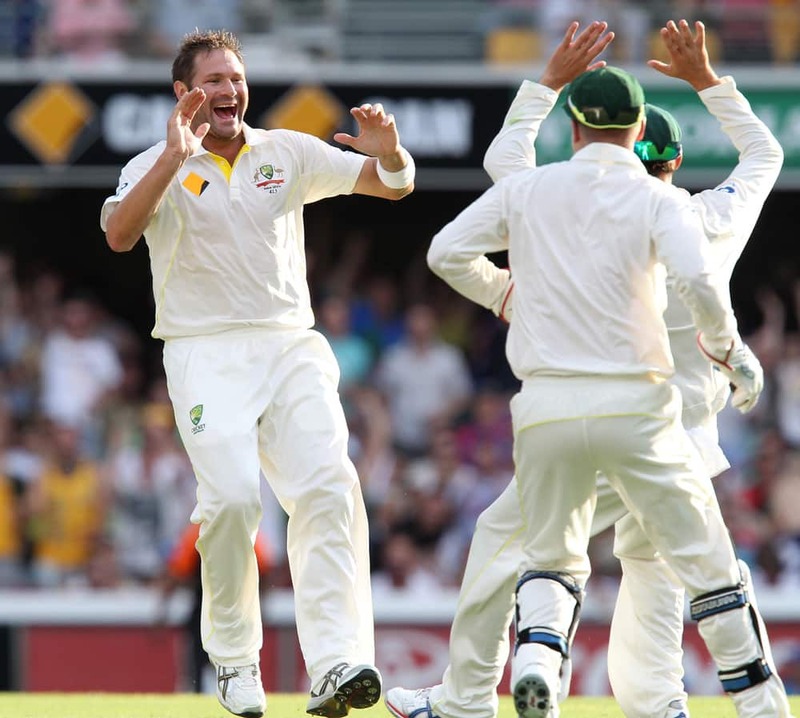 Ryan Harris celebrates after he got the wicket of Michael Carberry, on the third day of the series-opening Ashes cricket test at the Gabba in Brisbane, Australia. 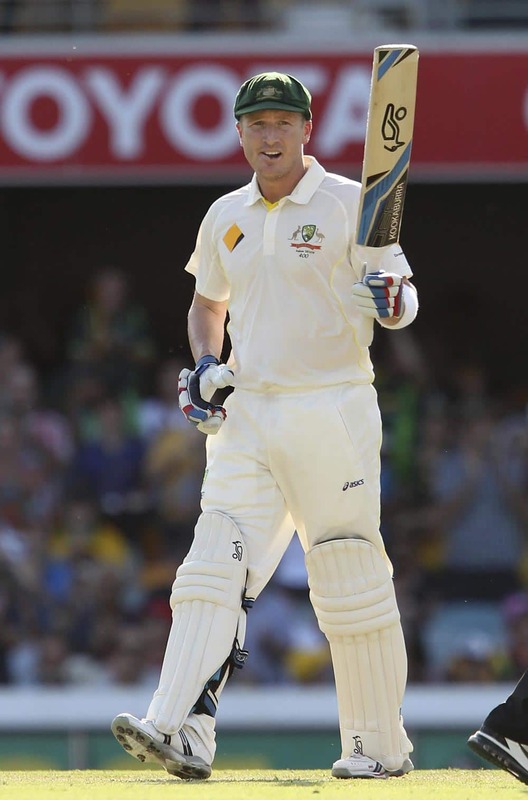 Brad Haddin salutes the crowd as he reaches 50 runs on the first day of the series-opening Ashes cricket test between England and Australia at the Gabba in Brisbane, Australia. 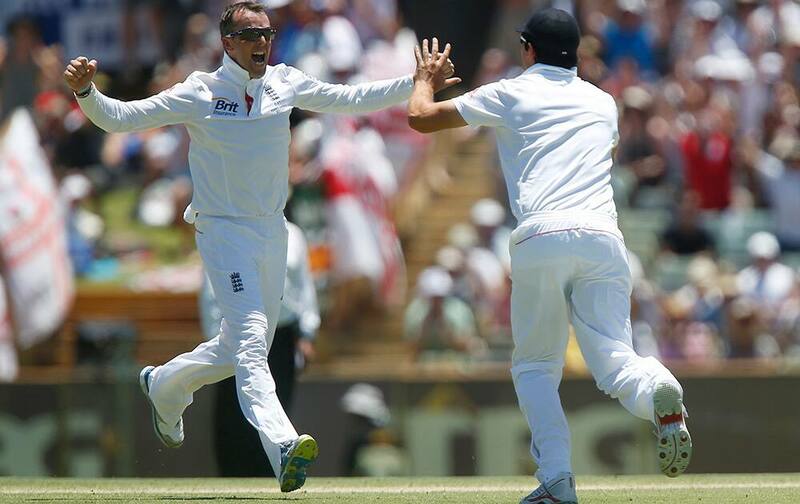 Alastair Cook celebrates with Graeme Swann after Swann got the wicket of George Bailey on the third day of the series-opening Ashes cricket test at the Gabba in Brisbane, Australia. 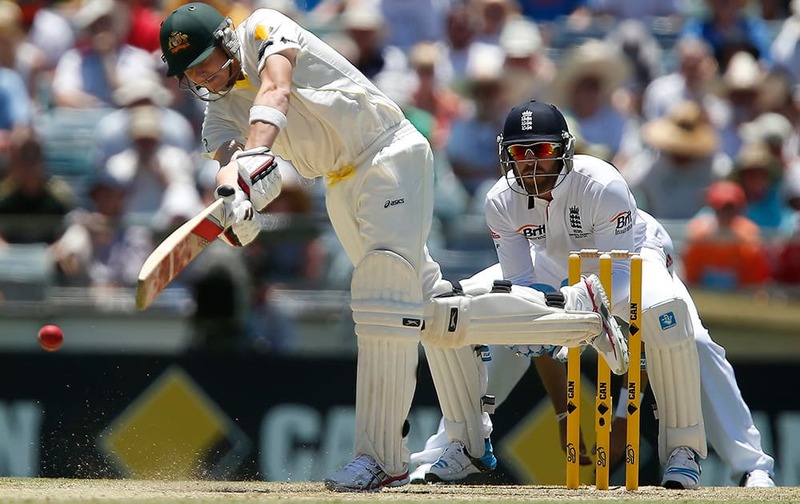 Australia's George Bailey plays a shot in front of England wicketkeeper Matt Prior, right, on the third day of their series-opening Ashes cricket test at the Gabba in Brisbane, Australia. 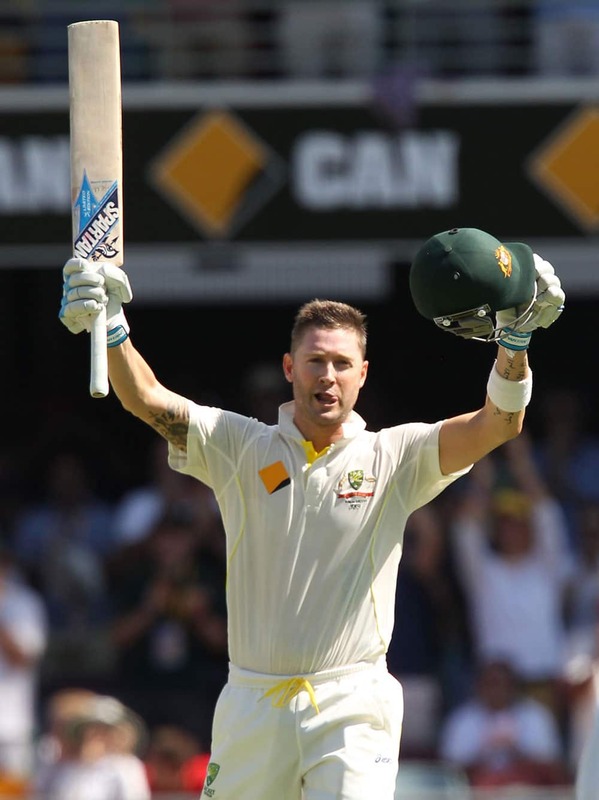 Australia's Michael Clarke celebrates as he reaches 100 runs on the third day of the series-opening Ashes cricket test between England and Australia at the Gabba in Brisbane, Australia. 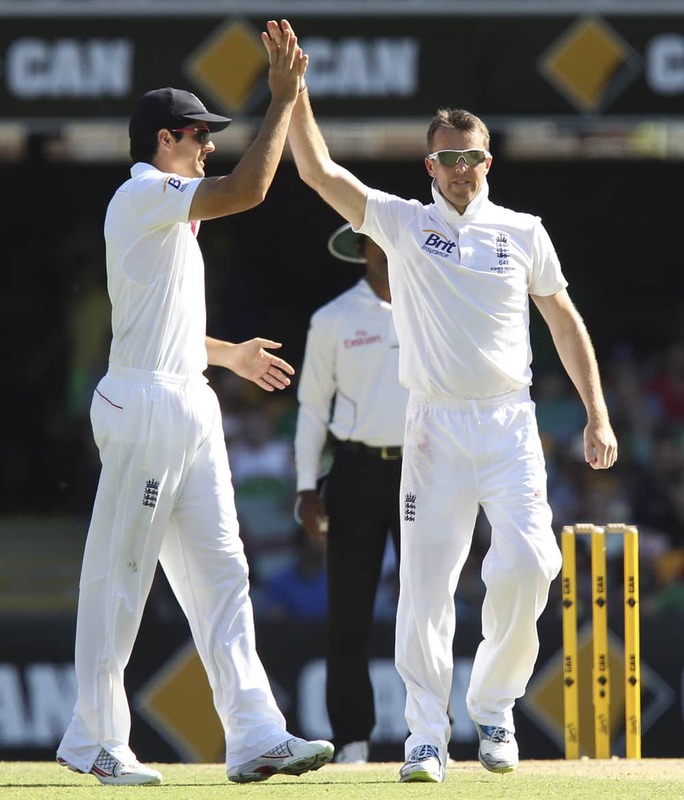 England's Chris Tremlett celebrates after he got the wicket of Australia's Shane Watson, left, on the third day of their series-opening Ashes cricket test match at the Gabba in Brisbane. 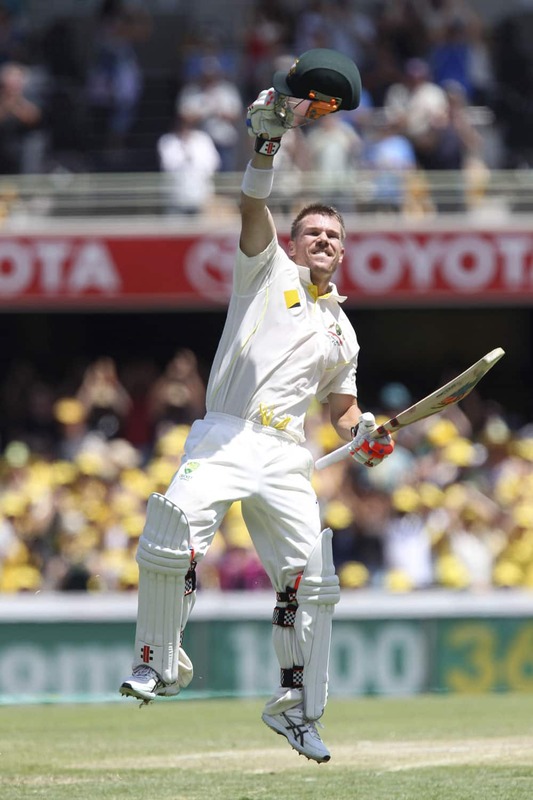 Australia's David Warner celebrates reaching his century on the third day of the series-opening Ashes cricket test between England and Australia at the Gabba in Brisbane, Australia. 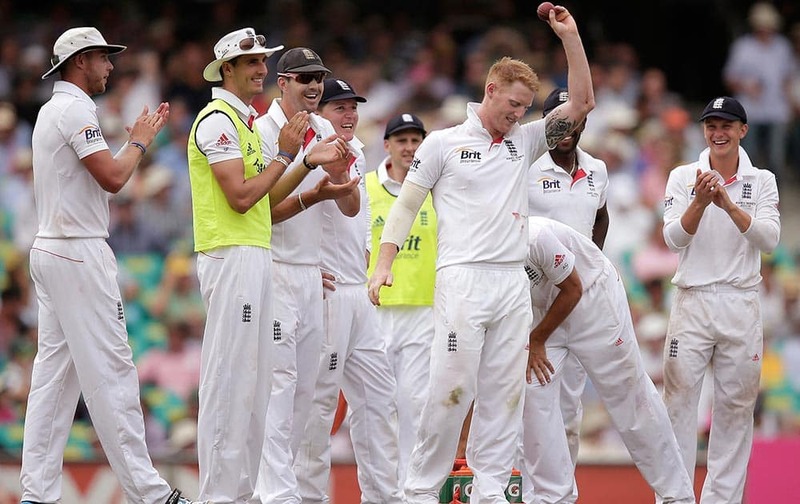 England's cricket team celebrates the wicket of Australia's Chris Rogers, foreground, on the third day of their series-opening Ashes cricket test match at the Gabba in Brisbane. 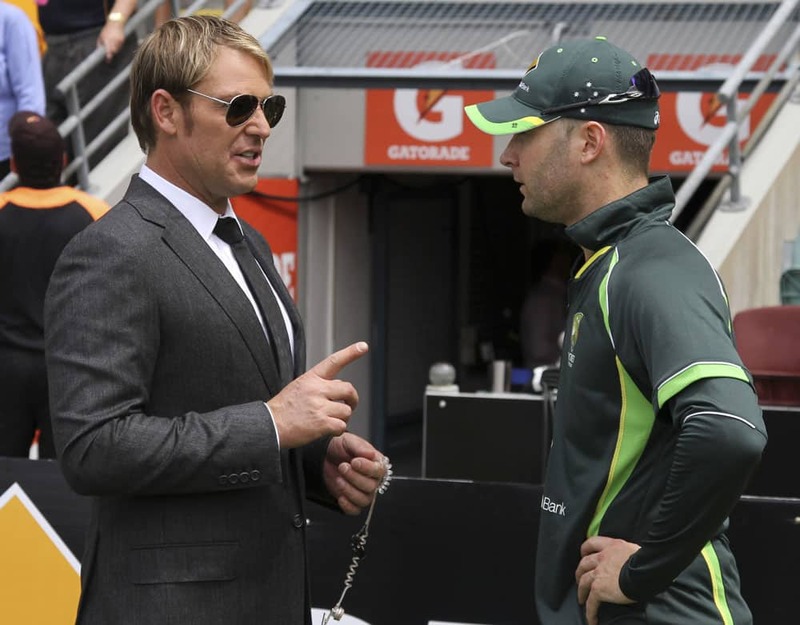 Former Australian cricket player Shane Warne, left, talks to Australian captain Michael Clarke before the start of play on the third day of the series-opening Ashes cricket test between England and Australia at the Gabba in Brisbane. 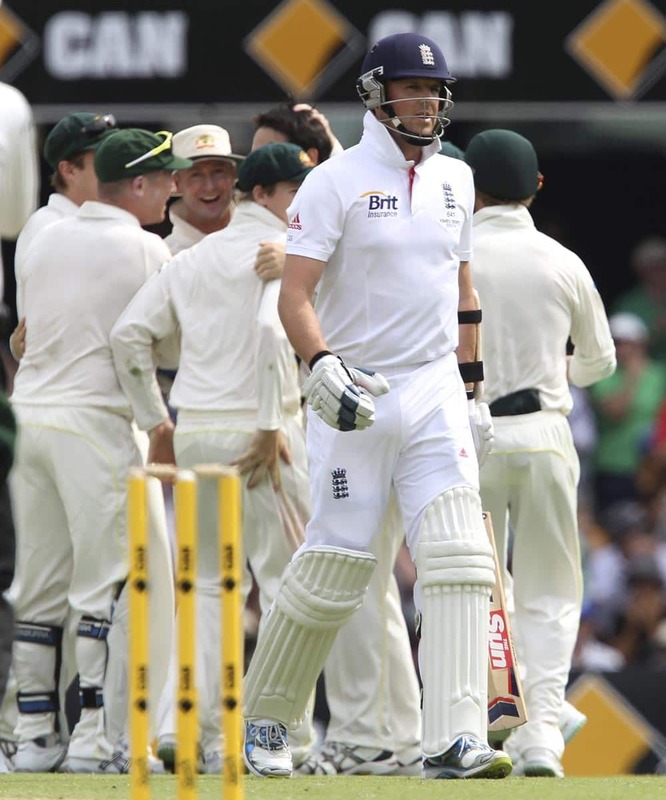 England's Graeme Swann, front, walks back to the dressing room as Australia celebrate his wicket on the second day of the series-opening Ashes cricket test between England and Australia at the Gabba in Brisbane. 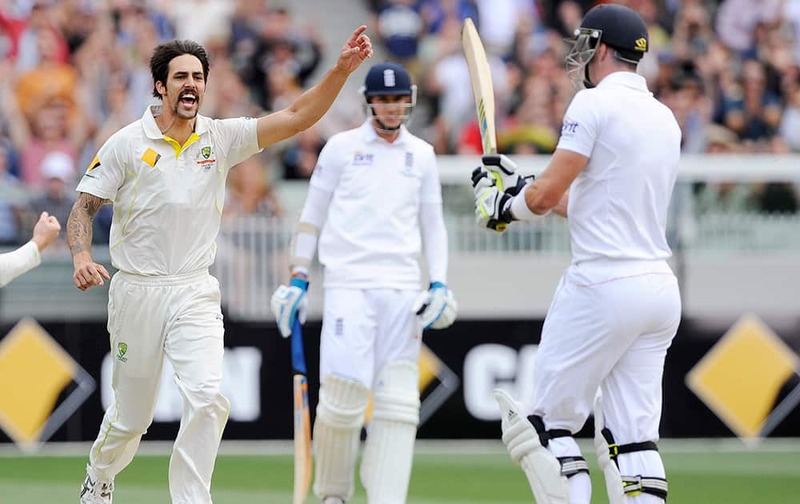 Australia's Mitchell Johnson, center, celebrates with David Warner, left, after he got the wicket of England's Michael Carberry, right, on the second day of the series-opening Ashes cricket test between England and Australia at the Gabba in Brisbane. 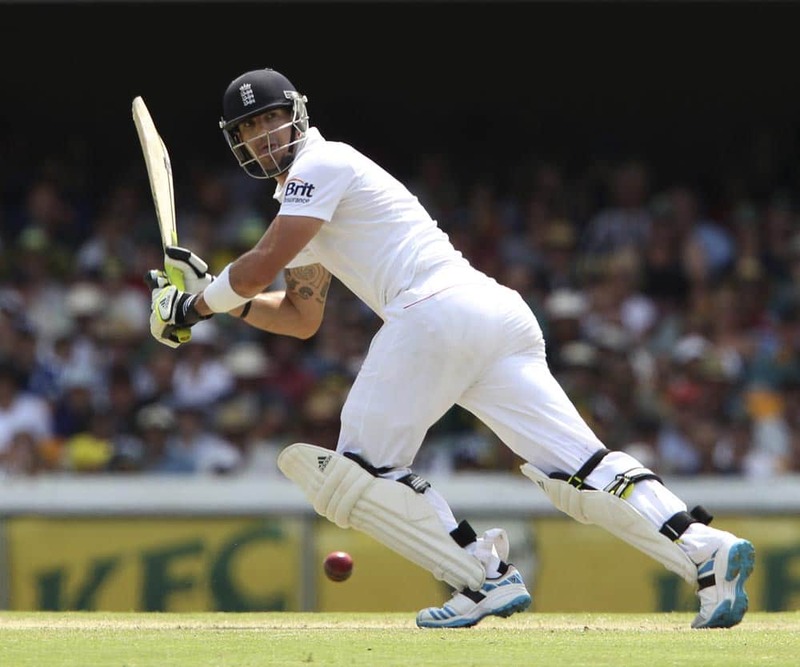 England's Kevin Pietersen plays a shot on the second day of the series-opening Ashes cricket test between England and Australia at the Gabba in Brisbane. 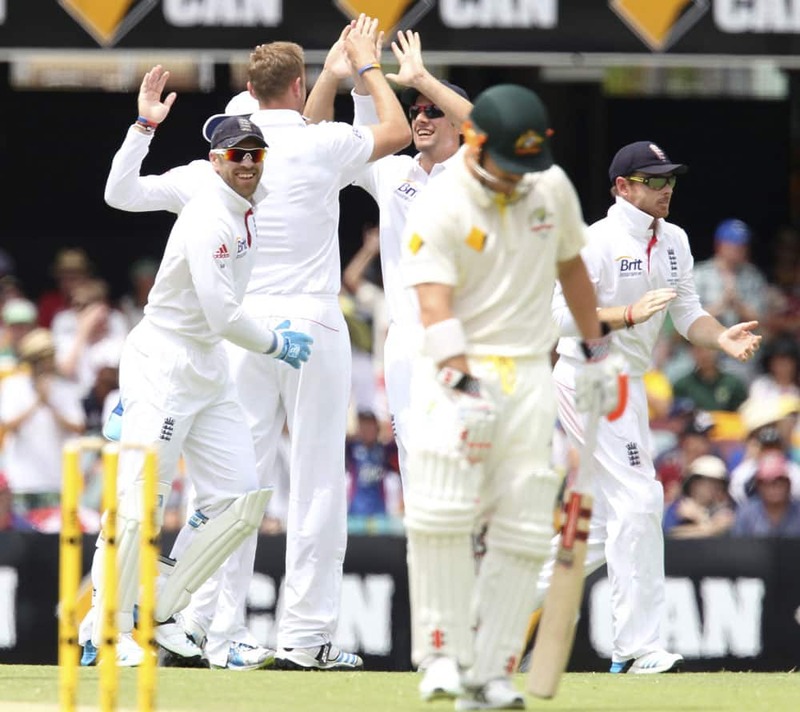 Australia's Steven Smith, center, celebrates with Ryan Harris, left, after Harris got the wicket of England's Alastair Cook, not shown, on the second day of the series-opening Ashes cricket test between England and Australia at the Gabba in Brisbane. 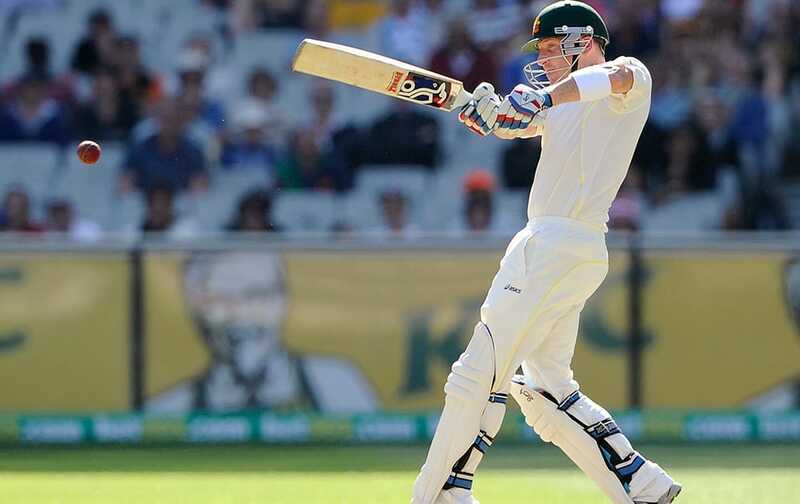 Australia's Brad Haddin plays a shot on the second day of the series-opening Ashes cricket test between England and Australia at the Gabba in Brisbane. 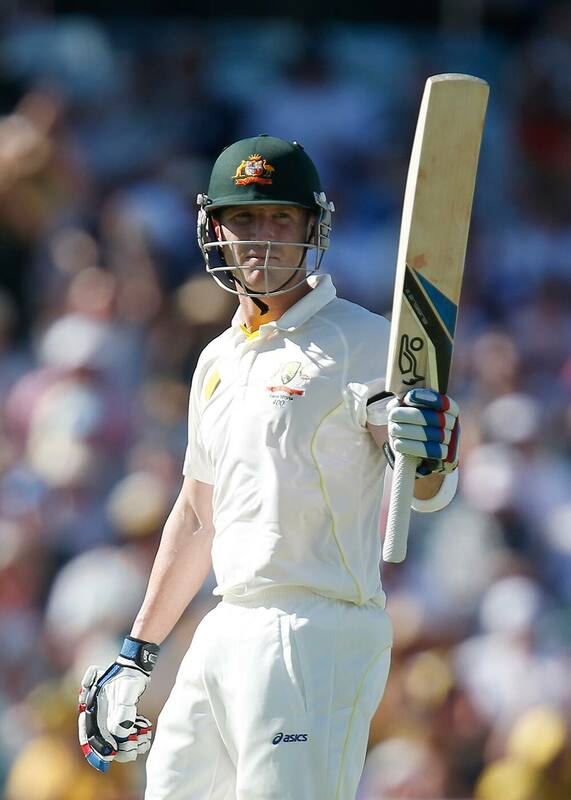 Australia's Brad Haddin salutes the crowd as he reaches 50 runs on the first day of the series-opening Ashes cricket test between England and Australia at the Gabba in Brisbane, Australia. 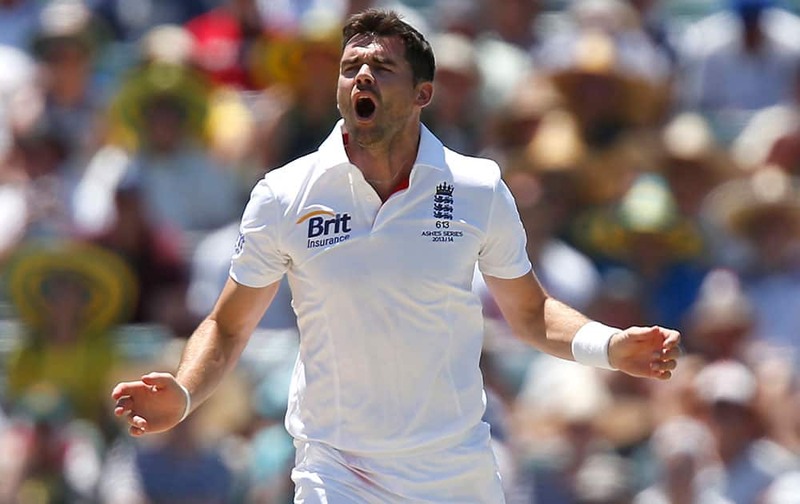 England's James Anderson celebrates after he got the wicket of Australia's George Bailey on the first day of the series-opening Ashes test between England and Australia at the Gabba in Brisbane, Australia. 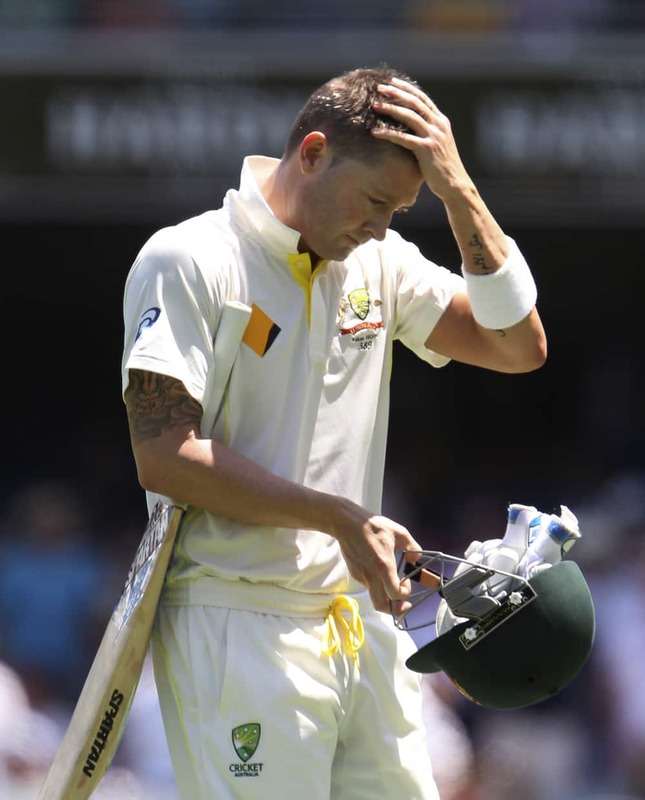 Australian captain Michael Clarke walks back to the dressing room after he lost his wicket for one run on the first day of the series-opening Ashes test between England and Australia at the Gabba in Brisbane, Australia. 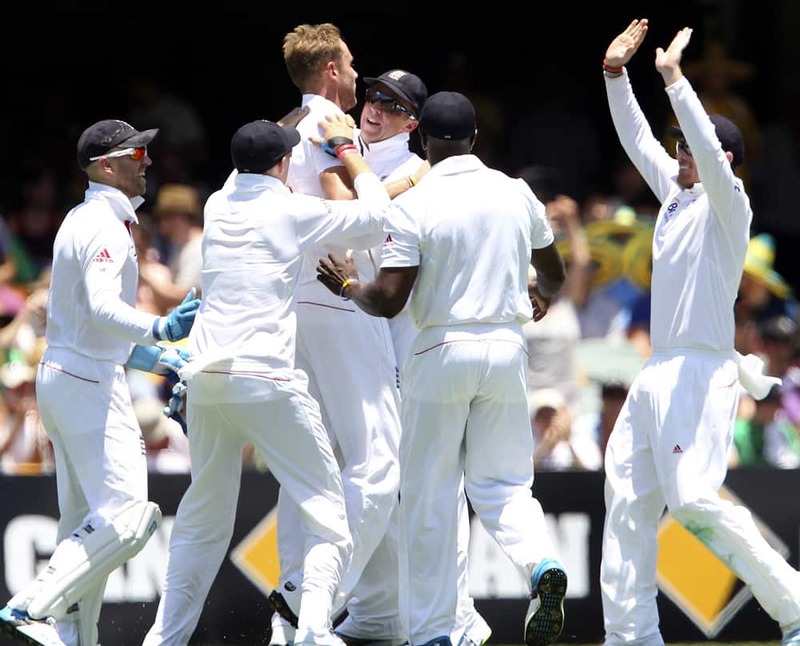 Stuart Broad celebrates with his teammates after he got the wicket of Australia's Shane Watson on the first day of the series-opening Ashes test between England and Australia at the Gabba in Brisbane, Australia. 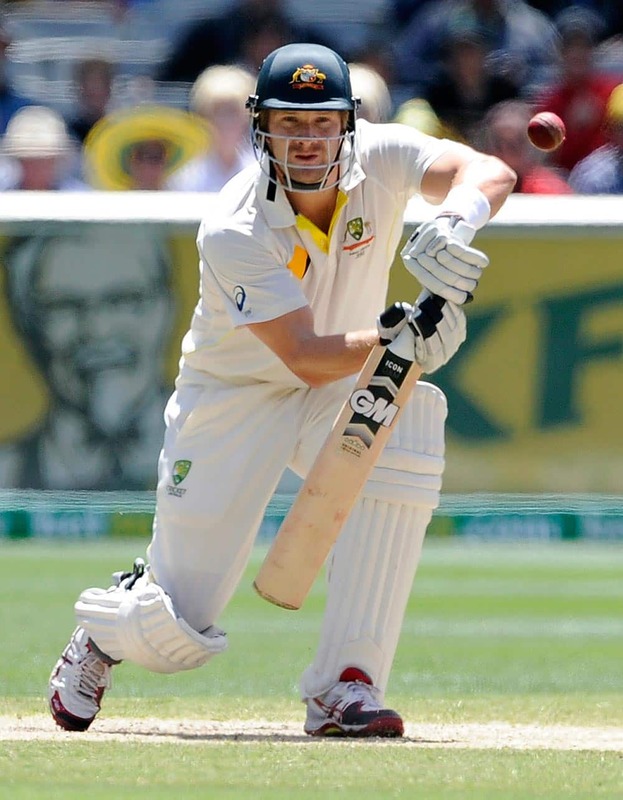 Shane Watson plays a shot on the first day of the series-opening Ashes test between England and Australia at the Gabba in Brisbane, Australia. 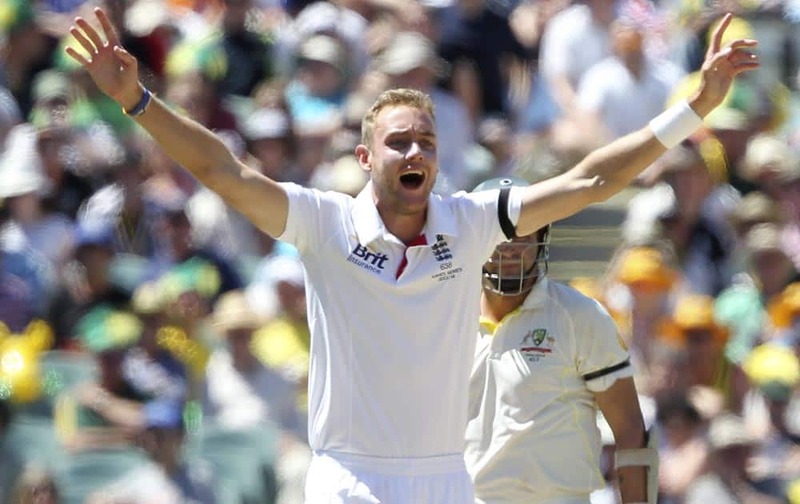 Stuart Broad celebrates after getting the wicket of Australia's Chris Roger on the first day of the series-opening Ashes test between England and Australia at the Gabba in Brisbane, Australia. 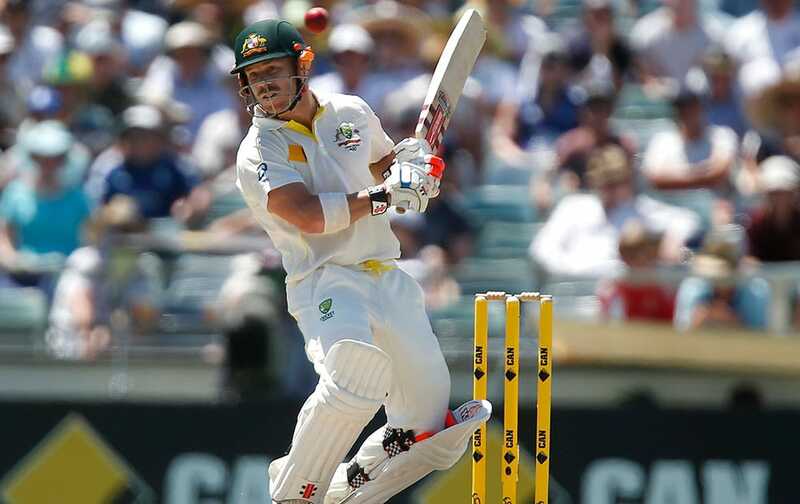 David Warner plays a shot on the first day of the series-opening Ashes test between England and Australia at the Gabba in Brisbane, Australia. 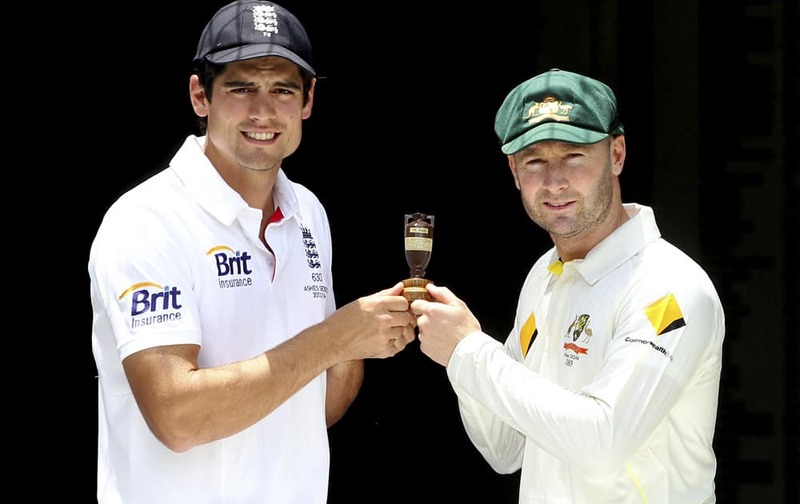 England captain Alastair Cook and Australian captain Michael Clarke pose with the replica of Ashes urn on the eve of the first test in the Ashes Series between England and Australia, in Brisbane, Australia. 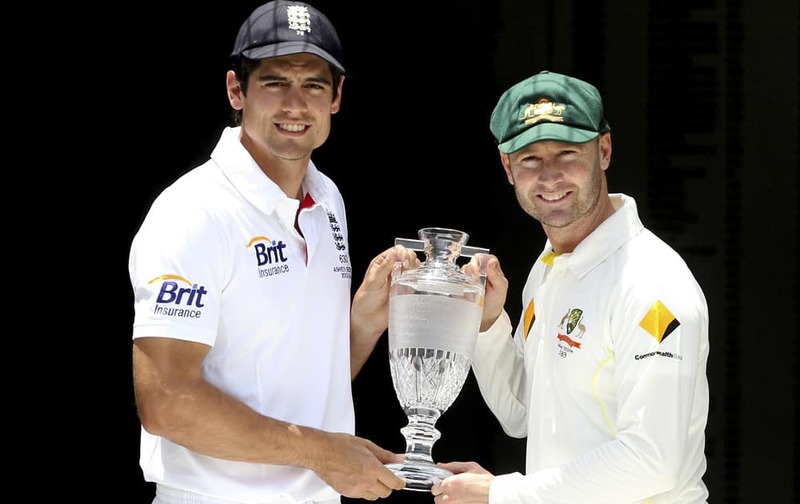 England captain Alastair Cook and Australian captain Michael Clarke pose with the Ashes Trophy on the eve of the first test in the Ashes Series between England and Australia, in Brisbane, Australia. 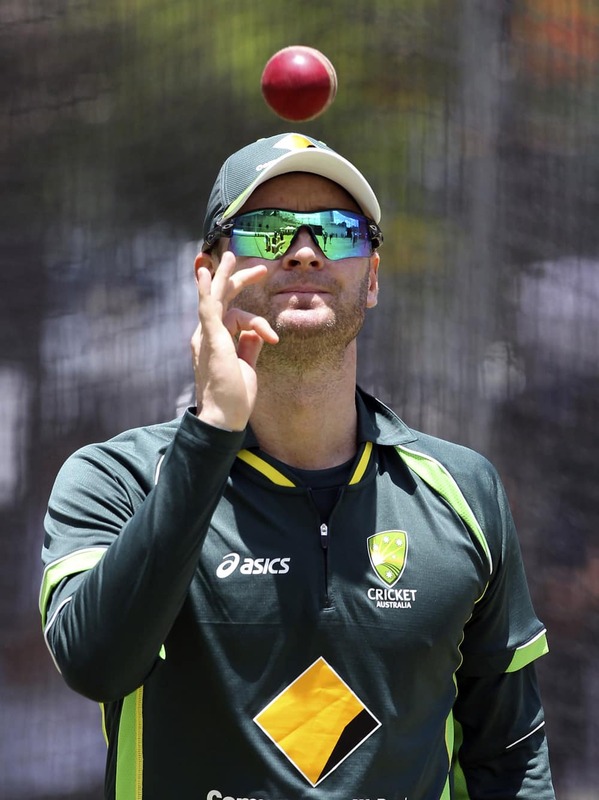 Michael Clarke attends at their final training session before the start of the first test in the Ashes Series between England and Australia, in Brisbane, Australia. 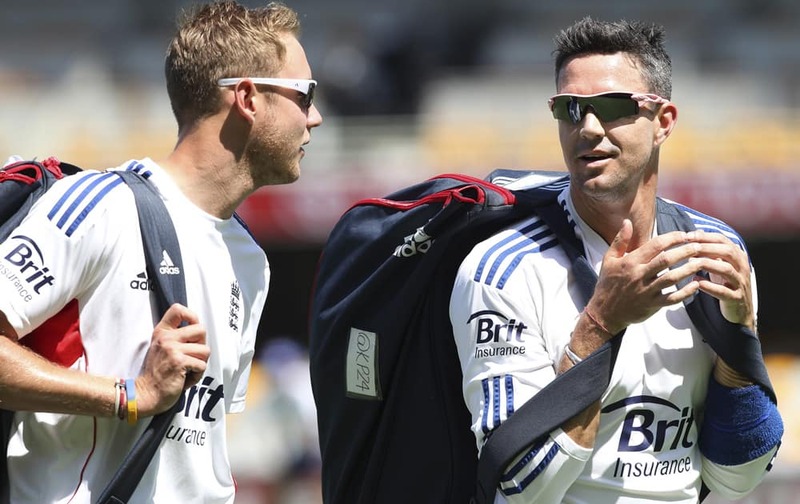 Stuart Broad talks to fellow team member Kevin Pietersen during the final training session on the eve of the first test in the Ashes Series between England and Australia, in Brisbane, Australia.